This article is about the Japanese car company. For other uses, see Suzuki (disambiguation). Suzuki Motor Corporation (Japanese: スズキ株式会社, Hepburn: Suzuki Kabushiki-Kaisha) is a Japanese multinational corporation headquartered in Minami-ku, Hamamatsu. Suzuki manufactures automobiles, four-wheel drive vehicles, motorcycles, all-terrain vehicles (ATVs), outboard marine engines, wheelchairs and a variety of other small internal combustion engines. In 2016, Suzuki was the eleventh biggest automaker by production worldwide. Suzuki has over 45,000 employees and has 35 production facilities in 23 countries, and 133 distributors in 192 countries. The worldwide sales volume of automobiles is the world's tenth largest, while domestic sales volume is the third largest in the country. Suzuki’s domestic motorcycle sales volume is the third largest in Japan. Faced with this colossal challenge, Suzuki returned to the production of motor vehicles. After the war, the Japanese had a great need for affordable, reliable personal transportation. A number of firms began offering "clip-on" gas-powered engines that could be attached to the typical bicycle. Suzuki's first two-wheeled vehicle was a bicycle fitted with a motor called, the "Power Free." Designed to be inexpensive and simple to build and maintain, the 1952 Power Free had a 36 cc, one horsepower, two-stroke engine. The new double-sprocket gear system enabled the rider to either pedal with the engine assisting, pedal without engine assist, or simply disconnect the pedals and run on engine power alone. The patent office of the new democratic government granted Suzuki a financial subsidy to continue research in motorcycle engineering. By 1954, Suzuki was producing 6,000 motorcycles per month and had officially changed its name to Suzuki Motor Co., Ltd. 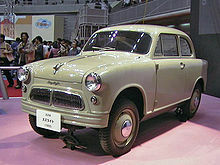 Following the success of its first motorcycles, Suzuki created an even more successful automobile: the 1955 Suzuki Suzulight. The Suzulight sold with front-wheel drive, four-wheel independent suspension and rack-and-pinion steering, which were not common on cars until three decades later. Volkswagen held a 19.9% non-controlling shareholding in Suzuki between 2009 and 2015. An international arbitration court ordered Volkswagen to sell the stake back to Suzuki. Suzuki paid $3.8bn to complete the stock buy-back in September 2015. The Suzuki Loom Company started in 1909 as a manufacturer of looms for weaving silk and cotton. Michio Suzuki was intent on making better, more user-friendly looms and, for 30 years his focus was on the development of these machines. Michio's desire to diversify into automotive products was interrupted by World War II. Before it began building four-stroke engines, Suzuki Motor Corp. was known for its two-stroke engines (for motorcycles and autos). After the war, Suzuki made a two-stroke motorized bicycle, but eventually the company would be known for Hayabusa and GSX-R motorcycles, for the QuadRunner, and for dominating racetracks around the world. Even after producing its first car in 1955 the company didn't have an automobile division until 1961. Today Suzuki is among the world's largest automakers, and a major brand name in important markets, including Japan and India, but no longer sells cars in North America. 1909: Michio Suzuki founds Suzuki Loom Works founded in Hamamatsu, Shizuoka Prefecture, Japan. 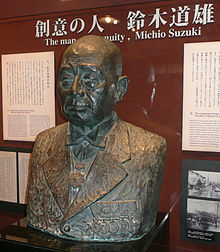 1920: incorporated, and capitalized at ¥500,000 as Suzuki Loom Manufacturing Co. with Michio Suzuki as president. 1937: Suzuki begins a project to diversify into manufacturing small cars. Within two years several innovative prototypes are completed, but the government declares civilian passenger cars a "non-essential commodity" at the onset of World War II, thwarting production plans. 1940: Takatsuka Plant is built in Kami-mura, Hamana-gun, Shizuoka, Japan. 1945: Plants close due to severe war damage. Company offices move to the Takatsuka Plant site. 1947: Head office moves to the present address. 1949: Company lists on the Tokyo, Osaka and Nagoya Stock Exchanges. 1950: Company has financial crisis due to labor difficulties. 1952: "Power Free" motorized bicycle marketed. 1953: Introduction of Diamond Free 60cc, 2-cycle motorized bicycle, displacement subsequently increases to 70cc. 1954: Company name changed to Suzuki Motor Co., Ltd.
1955: Introduction of Colleda COX 125cc 4-stroke single-cylinder, and Colleda ST 125cc, two-stroke single-cylinder motorcycles. Suzulight (360cc, two-stroke) front wheel drive car introduced at the start of Japan's minivehicle age. 1957: Michio Suzuki designated as adviser, and his son Shunzo Suzuki appointed as company president. 1958: S mark adopted as corporate emblem. 1959: Launch of Colleda Sel Twin (2-cylinder) 125cc, two-stroke motorcycle with electric starter. Introduction of all-new Suzulight TL 360cc light commercial, two-stroke minivehicle. September 26, Typhoon Vera (Ise-Wan) destroys Suzuki's assembly plant. 1960: In March Suzuki's new modern assembly line plant is finished. Suzuki enter a motorcycle race team into Grands Prix under the manufacturing name Colleda with riders Toshio Matsumoto, Michio Ichino and Ray Fay, placing 15th, 16th, and 18th in Isle of Man TT races. 1961: Separation of the loom machine division from the motor company, as Suzuki Loom Manufacturing Co.
Suzuki enter race motorcycles of RT61 125 cc and RV61 250 cc into Grands Prix under the Suzuki name with two riders from the team of Mitsuo Itoh, Michio Ichino, Sadao Masuda, Toshio Matsumoto, Paddy Driver, Hugh Anderson and Alastair King placing 10th and 12th in 250 cc Isle of Man TT races. Production of the Suzulight Carry 360cc, two-stroke lightweight truck begins at new plant in Toyokawa, Aichi Prefecture, Japan. 1962: First victory in the inaugural season of 50 cc Grand Prix motorcycle racing comes at the end of a three-way battle between Suzuki, Honda and Kreidler at the Isle of Man TT. The winning RM62 machine was ridden by Ernst Degner who had defected from the East German MZ team to Suzuki the previous year. 1963: Mitsuo Itoh makes history as the first Japanese rider to win the Isle of Man TT, when he takes the lead on the last lap of the 50cc race after Suzuki teammate Degner breaks down. Suzuki wins both the rider's and manufacturer's championships, in both 50cc and 125cc classes, for this season of World Grand Prix motorcycle racing. Subsidiary company opens in Los Angeles, to enter the American motorcycle market, as U.S. Suzuki Motor Corp.
1965: Enters outboard motor market with the launch of D55 5.5 hp, two-stroke engine. Introduction of Fronte 800 two-stroke subcompact passenger vehicle. T20 motorcycle introduced as "the fastest 250cc motorcycle in the world", aimed at the US market but gets worldwide attention. 1967: Thailand gets the first motorcycle assembly plant outside Japan, creating Thai Suzuki Motor Co., Ltd. Automobile plant built in Iwata, Shizuoka, Japan. Debut of Fronte 360cc, two-stroke minivehicle. 1968: After a winning 1967 season, the Suzuki motorcycle race team withdraws from World Grand Prix due to changes in FIM rules. Hans-Georg Anscheidt rides a 1967 machine in 1968 as a privateer, for the seventh season of Suzuki GP championships. Introduction of Carry Van 360cc, two-stroke minivan with a full cab over design. Launch of T500 motorcycle with an air-cooled parallel-twin 500cc engine, the largest displacement of any two-stroke at the time. 1969: Motorcycle plant built in Oyabe, Toyama, Japan. 1970: Foundry is built in Ogasa, Shizuoka, Japan; automobile plant is built in Kosai, Shizuoka. Frank Whiteway easily wins the 500cc class at the Isle of Man TT race on a production T500 motorcycle prepared by Eddie Crooks. LJ10, the first mass-production 4x4 domestic mini-car, becomes available in Japan, powered by a 360cc twin cylinder air-cooled two-stroke engine. 1971: Production plant for medium to large motorcycles is built in Toyokawa, Aichi, Japan. GT750 motorcycle debuts with a liquid-cooled two-stroke straight-three engine. Suzuki's production motocrosser, the TM400, arrives to participate in 500cc class Motocross World Championship racing. Suzuki rider Roger De Coster becomes the 500cc class World Motocross Champion on his 396cc RN71 factory machine, while teammate (and fellow Belgian) Joel Robert becomes 250cc class champion. 1972: Suzuki Parts Manufacturing Company, Ltd., is established in Akita Prefecture, Japan. The Hustler 400 (TS400) motorcycle released as a street version of the TM400. 1973: Jitsujiro Suzuki appointed as president, and Shunzo Suzuki appointed as chairman. Canadian subsidiary set up in Downsview, as Suzuki Canada Ltd., to supply machines and parts to motorcycle dealers in Canada. 1974: Indonesian subsidiary established in Jakarta as P.T. Suzuki Indonesia Manufacturing. Company enters into medical equipment field with launch of the Suzuki Motor Chair Z600 motorized wheelchair. Expansion into the housing field initiated with Suzuki Home marketing two models of prefab "Mini-House" and three types of storage sheds. RE5 introduced as the first Japanese (production) motorcycle with a rotary engine in the world. 1975: Delays in compliance with car emission regulations cause severe difficulties for the company. Philippine distributor Rufino D. Antonio and Associates institute a joint venture with Suzuki (Japan) under the name of Antonio Suzuki Corporation, to expand motorcycle sales in the Philippines. LJ50 (Jimny) 4x4 released in Australia with a more powerful, export-only, 550 cc liquid-cooled two-stroke straight-three engine. RM125 introduced as a production version of the works machine RA75 on which Gaston Rahier won the 125cc World Motocross GP championship. From 1975 to 1984, Suzuki dominates this class 10 years in a row with Gaston Rahier, Akira Watanabe, Harry Everts, Eric Geboers and Michele Rinaldi. Assembly outside Japan commences for the first time, in Pakistan. Assembly kits of the ST90 Carry and LJ80 (Jimny) are shipped, both with 800 cc engines. Production and sales were done by two local entities (Sind Engineering and Naya Dauer Motor) under the auspices of PACO (Pakistan Automobile Corporation). 1976: GS Series motorcycles released, the GS750 and GS400 are the first four-stroke machines from Suzuki in 20 years. Pops Yoshimura enters the GS750 for the first time in the AMA Superbike series, wins at Laguna Seca Raceway. 1977: Debut of Cervo two-stroke minivehicle for domestic market, export version introduced the next year with four-stroke engine. Last of the LJ utility 4x4 series, the LJ80, gets a new four-cylinder water-cooled 800cc four-stroke engine, and is exported to Australia and Europe the following year. 1978: Appointment of Osamu Suzuki as president, Jitsujiro Suzuki appointed as chairman. The flagship model of the GS Series, the GS1000E, becomes available as Suzuki's first 1-liter machine. A Yoshimura GS1000 ridden by Californians Mike Baldwin and Wes Cooley wins the first Suzuka 8 Hours Endurance Road Race. 1979: Alto two-stroke minivehicle introduced. This car was a massive success, propelling Suzuki into seventh place amongst Japanese car and truck manufacturers, and helped the company's bargaining position when later linking up with Isuzu and General Motors. 1980: Suzuki Australia Pty. Ltd. established in Sydney, Australia. Suzuki enters general-purpose engine field by marketing three electric power generator models. Launch of the GSX series of motorcycles with four-stroke, DOHC four-valve engines. 1981: Consolidated (i.e., including subsidiaries) sales for the fiscal year reach ¥500 billion. General Motors and Isuzu Motors announce cooperation with Suzuki Motor Company in the production and marketing of new "mini-cars". GM purchases a 5.3% stake in Suzuki. The RG Gamma (RG Γ) makes its first appearance in Grand Prix motorcycle racing; Suzuki wins sixth-consecutive manufacturer's title, and Suzuki rider Marco Lucchinelli becomes the 500 cc class champion. German designer Hans A. Muth uses the motif of the samurai sword to create the original GSX1100S Katana, a motorcycle that "typifies Suzuki". Production begins on a second generation of 4x4 utility vehicles with 1-liter engines; the SJ410 is designed for export and sold as the Suzuki Samurai in Canada, and as the Jimny 1000 in some markets. 1982: Aggregate (i.e., sum-total) motorcycle production at the Toyama Plant reaches 5 million units. Italian Franco Uncini, riding a Roberto Gallina racing team RG Γ motorcycle, takes the Grand Prix championship in the 500 cc class. Suzuki wins the manufacturer's title for the seventh consecutive year. Masaru Mizutani (in Japanese) on his RG Γ takes first place in seven consecutive events and wins the All Japan Road Race Championship for the 500cc class. The company and the Government of India set up Maruti Udyog Ltd. as a joint venture for automobile production and distribution. The company signs a technological tie-up contract with Land-Rover Santana S.A., Spain. Car production begins at Pak Suzuki Motor Co., Ltd. in Karachi, Pakistan. A joint venture with Pakistan Automobile Corporation (PACO), Pak Suzuki was established in September 1982 as Awami Auto Limited. The very first production four-wheel all-terrain vehicle is released; the QuadRunner 125 begins the era of four-wheelers and transforms the ATV industry. 1983: Jitsujiro Suzuki steps down from the chairmanship. A second Kosai, Shizuoka automobile plant is built for compact cars. The RG250Γ motorcycle is released as the first-ever full-blown racer-replica, with technology developed for the racetrack. Launch of the Mighty Boy 550cc, 4-cycle mini commercial vehicle. The Cultus (Swift/Forsa/SA310) 1-liter passenger vehicle debuts. Production of Suzuki cars begins at Maruti Udyog Ltd. in New Delhi, India. 1984: Suzuki New Zealand Ltd. established in Wanganui, New Zealand. Suzuki France S.A. is established in Trappes, France. Suzuki Motor GmbH Deutschland is established in Heppenheim, Germany. Suzuki starts exporting 1-liter Cultus to U.S. automaker General Motors Corp.
An upgraded SJ 4x4, with a 1.3-liter four-cylinder engine and a five-speed gearbox, is released. The SJ413 is sold in the U.S. market (as the Samurai) the following year, and ultimately in over 100 countries. Suzuki signs a car production technical assistance contract with China National Aero-Technology Import & Export Corporation. Introduction of the GSX-R750 motorcycle with an oil-cooled 4-cylinder DOHC engine. 1985: Aggregate sales of Alto in Japan reach 1 million units. Suzuki of America Automotive Corp. established in Brea, California. Samurai introduced in USA. Company signs a motorcycle production technical tie-up contract with Jinan Qingqi Motorcycle Co., Ltd. in China. Production of Suzuki cars begins at Santana S.A., Spain. The factory is in Linares, Andalusia. Scooter production started at Avello S.A. of Spain. 1986: American Suzuki Motor Corp. is established in Brea, California, to consolidate operations in USA. Suzuki reaches an agreement with General Motors Corp. of Canada for cooperation in establishment of a joint venture company. 1987: Aggregate car exports from Japan reach 2 million units. Annual global sales of automobiles reach 1 million units. Cultus/Swift production began in Colombia. Suzuki reaches an agreement with Mazda Motor Corp. for cooperation in production of micro-mini vehicles. 1988: Escudo (Vitara/Sidekick) 1.6-liter, four-cycle compact 4x4 vehicle debuts. Magazine published by Consumers Union claims the Samurai 4x4 is prone to rolling over. The National Highway Traffic Safety Administration rejects demands for a Samurai recall. Swift sales begin in the United States. 1989: Aggregate car production reached 10 million units. Production of Suzuki cars begins at CAMI Automotive Inc. in Ontario, Canada. Sidekick sales begin in the United States. 1990: Company changes its name to Suzuki Motor Corporation. Kei car standards are upgraded. New mini-vehicles are released under the latest specifications: engine capacity raised to 660cc; overall length extended to 10.8 feet (3.3 m). 1991: Consolidated sales reach ¥1 trillion. Suzuki signs a car production contract in Hungary, establishing Magyar Suzuki Corporation. Production of Suzuki cars begins in Korea through a technical tie-up with Daewoo Shipbuilding and Heavy Machinery Ltd.
Cappuccino mini two-seater convertible debuts. 1992: Production of Suzuki cars begins at the new plant of Pak Suzuki Motors in Karachi, Pakistan. Production and sales of Hungarian-built Suzuki cars begin. Suzuki becomes a 50% partner in Maruti Udyog. 1993: Aggregate (i.e., sum-total) motorcycle production at Thai Suzuki Motor Co., Ltd. reaches 2 million units. Passenger car production/sales began at Suzuki Egypt S.A.E. Suzuki signs joint-venture contracts for production of passenger cars and motorcycles in China. Wagon R minivehicle debuts, wins 1993 RJC Car of the Year award. 1994: Aggregate sales of Suzuki cars in Japan reach 10 million units. Maruti Udyog of India aggregate car production reach 1 million units. Suzuki and Isuzu Motors Ltd. agree to dissolve their business tie-up. 1995: Aggregate sales of Suzuki minivehicles in Japan reach 10 million units, aggregate motorcycle exports from Japan reached 20 million units. Suzuki pulls out of its capital tie-up with Santana S.A. in Spain but continues car-related technical cooperation. 1996: Aggregate sales of Carry in Japan reach 3 million units. Vietnam Suzuki corporation starts production of motorcycles and automobiles in the Bien Hoa industrial zone. Production of Suzuki Motorcycles begins at Jinan Qingqi Suzuki Motorcycle Co., Ltd., China. 1997: Achieved 10 million cumulative automobile sales for overseas market. Four stroke outboard motors win the Innovation Award at The International Marine Trade Exhibit and Conference (IMTEC) in Chicago. American Suzuki Motor Corp. publicly accuses Consumers Union of rigging 1988 test results for the Samurai 4x4, using videotape obtained through the discovery process in the Suzuki v. Consumers Union lawsuit. Suzuki goes to the International Court of Arbitration over the Indian government's appointment of a senior executive at Maruti Udyog Ltd.
1998: Suzuki and General Motors Corporation agree on joint development of compact vehicles, both companies agree to strengthen their business tie-up and form a strategic alliance. GM changes its equity stake in Suzuki from 3.3% to 10%. Suzuki and the Indian government settle their dispute over the Indian government's appointment of a senior executive at Maruti Udyog Ltd.
Changan Suzuki Automobile Co., Ltd. begins production of passenger cars in Chongqing, China. A new joint venture with the government of Burma opens a manufacturing plant in Yangon. Introduction of GSX 1300R Hayabusa 1299 cc sport bike, the fastest production motorcycle in 1999–2000 model years. Ryosaku "Rick" Suzuki, grandson of Michio Suzuki, becomes president of American Suzuki Motor Corp.
1999: Aggregate motorcycle production reaches 40 million units, aggregate sales of Wagon R in Japan reach 1 million units. Jiangxi Changhe Suzuki Automobile Co., Ltd. receives official approval from the Chinese government for production of commercial vehicles. General Motors Argentina, S.A. and Suzuki Motor Corporation form an industrial and commercial alliance by which General Motors in Argentina distributes all Suzuki automotive products. 2000: The corporation commemorates its 80th anniversary. Aggregate car production at the Kosai Plant reaches 10 million units. GM raises its stake in Suzuki Motor Corp. to 20 percent. 2001: Aggregate worldwide sales of Jimny/SJ reaches 2 million units, production of Alto reaches 4 million units. Suzuki achieves "Zero-Level" target of landfill waste. Aerio compact car (aka Liana for Life In A New Age) introduced at the Geneva Motor Show. Suzuki Motor Corp. (Japan) and American Suzuki Motor Corp. jointly create Suzuki Manufacturing of America Corporation (SMAC) to build all-terrain vehicles for sale in the U.S. and Canada, as well as for export. 2002: Achieved 30 million cumulative automobile sales for worldwide market. Introduction of the Choinori low-cost scooter. SMAC opens Suzuki's only U.S. manufacturing facility in Rome, Georgia and begins producing the Eiger series of ATVs. 2003: Suzuki is No.1 in Kei car sales for the 30th consecutive year in Japan. Twin, the first hybrid Kei car is launched in Japan. Suzuki Motor Corporation and Fiat Auto S.p.A. announce they will jointly develop and produce a compact sport utility vehicle at Magyar Suzuki. 2004: Aggregate domestic automobile sales reach 15 million units. After eight years, the Suzuki v. Consumers Union lawsuit about a magazine review that said the Samurai 4x4 easily tipped over, is settled out of court. Second-generation Swift compact car debuts at the Paris Motor Show. 2005: Aggregate car production at Maruti Udyog Ltd. reaches 5 million units, and aggregate motorcycle production in Indonesia also reaches 5 million units. In French-speaking Canada (not France) the Un Mode de vie! slogan is a word-for-word translation of the English, but with the indefinite article prefixed. The Entre e divirta-se. slogan in Brazilian Portuguese (not in Portugal) translates as "Come and have fun" ending with a full stop. The new Swift wins 2005–2006 Car of the Year Japan "Most Fun" award, and is awarded the 2006 RJC Car of the Year. 2006: The SX4 mini crossover is introduced at the Geneva Motor Show and the XL7 crossover 4x4 is introduced at the New York International Auto Show. GM divests, selling 92.36 million shares of Suzuki Motor Corporation and reducing their stake to 3%. 2007: Aggregate domestic automobile sales reach 15 million units. Company says that Maruti Suzuki will build the A-Star compact hatchback in India for export worldwide. Nissan North America Inc. and Suzuki Motor Corp. announce that a midsize pickup truck (based on Nissan's Frontier) to be sold by Suzuki in North America, will be built at Nissan's plant Smyrna, Tennessee. 2008: GM divests its remaining 3% stake in Suzuki. Rick Suzuki steps down as chairman of American Suzuki Motor Corp., due to poor U.S. sales and earnings. 2009: 100th anniversary of the Suzuki brand name. Suzuki markets its first production pickup truck called the Equator. Volkswagen and Suzuki announce the establishment of a global strategic partnership. The Volkswagen Group will buy a 20% stake in Suzuki Motor Corp.
November: Suzuki breaks ground on a new 650,000 m2. factory in Eastern Seaboard Industrial Estate in Rayong Province, Thailand, the 20 billion yen investment for eco-car production to start in March 2012. 2010: Aggregate sales of Suzuki cars in Japan reach 20 million units. January: Volkswagen Group completes its purchase of 19.9% of Suzuki's outstanding shares. Its plant in Yangon, Burma, was closed after the joint venture with the government between 1998 and 2010 had expired. 2011: Suzuki announces Indonesia will become a regional production base with investment up to $800 million over the next few years. February: Suzuki Manufacturing of America Corp. (SMAC) celebrates the 10th anniversary of its Rome, Georgia, plant, and $1.4 billion sales in the past decade. November: Suzuki terminates its partnership with VW in accordance with terms of the agreement, and commences arbitration proceedings for return of Suzuki shares held by the Volkswagen Group. 2012: Aggregate domestic sales in India by Maruti Suzuki reaches 10 million units. Aggregate domestic sales of minivehicles in Japan reaches 20 million units. January: Suzuki announces plans to build a new engine factory as the third factory in Indonesia for the fast-growing Southeast Asian market. Suzuki spent ¥10 billion ($130 million) for a 1.3 million square-metre site in an industrial park outside Jakarta, and the plant may cost ¥30 billion to build. February: Suzuki Motor Corp. and Intelligent Energy of Loughborough in the UK, a manufacturer of hydrogen-powered fuel cells, announce a joint venture to accelerate the commercialisation of zero-emission vehicles. March: Suzuki Motor Thailand starts production and sales of the new Swift compact car. November: American Suzuki Motor Corp. files for Chapter 11 bankruptcy protection. Owing to its focus on small cars, a strong yen and stringent US safety regulations which have hurt growth, Suzuki Motors announces it will discontinue building autos for the US market and focus instead on motorcycles, ATVs and marine equipment. U.S. sales had peaked in 2007 but had dropped to a quarter of that by 2011. Suzuki got the approval for setting up a new factory and revive its plant in Yangon. This will resume its vehicle and spare part production in Myanmar which was closed in 2012. One-Millionth commemorative edition GSX-R1000 model celebrates a million motorcycles produced in the Suzuki GSX-R series since 1985. 50th anniversary Special Edition GSX-R1000 model celebrates Suzuki's 1963 entry into the U.S. motorcycle market. March: In spite of a 2012 statement to the contrary, Suzuki Canada Inc. announced it would discontinue its auto-building operations in Canada as part of its Chapter 11 bankruptcy proceedings in the U.S. It was contemplated that the sale of motorcycles, ATVs and marine equipment would continue in Canada as well as in the U.S. Debut of the second-generation SX4 crossover vehicle at the 83rd Geneva International Motor Show. American Suzuki Motor Corporation ends all operations as of 31 March, selling its assets to Suzuki Motor of America, Inc., a wholly owned subsidiary of Suzuki Motor Corporation. July: News reports suggested that disaccord over the erstwhile alliance between Volkswagen and Suzuki might be settled as a result of renewed talks between the two companies. These reports were soon denied by Executive Vice President Toshihiro Suzuki, who said that "there have been various reports, but there absolutely are no such facts, so there is nothing I can talk about on this topic." October: Suzuki recalls 210,228 motorcycles in the U.S. because the front brakes might not work properly. Permanent court of arbitration showed a judgment that VW owned Suzuki shares should be sold, and officially dissolved the alliance with Suzuki's stock (19.9%) held by VW. Suzuki withdrew from China in September 2018. Maruti Baleno Rally Car in Mysore Safari Rally in 2005. Based in Gurgaon, Harayana, Maruti Suzuki India Limited is an Indian automobile manufacturer that is a subsidiary of Japanese automaker Suzuki Motor Corporation. Maruti Suzuki produced 1,133,695 units between 1 April 2011 and 30 March 2012. The Suzuki Motor Corporation owns 54.2% of Maruti Suzuki and the rest is owned by various Indian public and financial institutions. The company was incorporated in 1981 and is listed on the Bombay Stock Exchange and National Stock Exchange of India. Maruti Suzuki was born as a Government of India-led company named Maruti Udyog Limited, with Suzuki as a minor partner, to make lower priced cars for middle class Indians. Over the years, the product range has widened and ownership has changed hands as the customer has evolved. Maruti Suzuki offers models ranging from the Maruti 800 to the premium sedan Maruti Suzuki Kizashi and luxury SUV Maruti Suzuki Grand Vitara. Maruti 800 was the first model launched by the company in 1983 followed by mini-van Maruti Omni in 1984. Maruti Gypsy, launched in 1985, came into widespread use with the Indian Army and Indian Police Service becoming its primary customers. 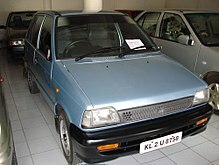 The short-lived Maruti 1000 was replaced by Maruti Esteem in 1994. Maruti Zen, launched in 1993, was the company's second compact car model. The company went on to launch another compact car Maruti Wagon-R followed by Maruti Baleno in 1999. It was later replaced by the Suzuki SX4. The SX4 further was replaced by Ciaz. In 2000, Maruti Alto was launched. The Maruti models include Maruti Suzuki Grand Vitara, launched in 2003, Maruti Versa, launched in 2004, Maruti Suzuki Swift, launched in 2005, Maruti Zen Estilo and Maruti Suzuki SX4, launched in 2007. On 14 February 2011, Maruti announced that it had achieved one million total accumulated production volume of the Alto. The Alto has reached the million units mark in just seven years and five months since its launch in September 2000. The last half of the million was achieved in 25 months. The Alto became the third car by Maruti Suzuki stable to cross the million units mark, following the Maruti 800 and the Omni. In January 2012 at the New Delhi Auto Expo, Maruti presented a new car called the Maruti Suzuki XA Alpha, to commence production in mid-late 2013. Maruti Suzuki unveiled the Vitara Brezza in the Indian Auto Expo 2016 as a contender in the compact SUV segment. Maruti Exports Limited is Maruti's exporting subsidiary and, as such, does not operate in the domestic Indian market except in its capacity as an exporter for Maruti Suzuki and for the international Suzuki Motor Corporation as well as their other affiliates. The first commercial consignment of 480 cars were sent to Hungary. By sending a consignment of 571 cars to the same country, Maruti crossed the benchmark of 3,000,000 cars. Since its inception export was one of the aspects the government has been keen to encourage. American Suzuki headquarters is in Brea, California. The company announced in November 2012 that it would stop selling cars in the United States. Through an agreement with General Motors, Suzuki began selling a version of their Suzuki Cultus in the United States as the Chevrolet Sprint in 1985. This model was initially sold as a 3-door hatchback and would be Chevrolet's smallest model. The Samurai was also introduced in 1985 for the 1986 model year and was the first car introduced to the United States by the newly created American Suzuki Corp. No other Japanese company sold more cars in the United States in its first year than Suzuki. The Samurai was available as a convertible or hardtop and the company slogan was Never a Dull Moment. The Samurai was successful until Consumer Reports alleged the Samurai of being susceptible to roll over in a 1988 test. This led to a much publicized 1996 lawsuit, not settled until 2004. In 1995, American Suzuki introduced the Esteem and redesigned the Swift. The Swift GT was dropped and this version Swift was specific only to North America where it was built at CAMI. These models were the first Suzuki vehicles to be marketed in North America with dual front airbags. A station wagon version of the Esteem was introduced in 1996. Worldwide Suzuki production reached more than 975,000 cars this[which?] year. Also in 1996, American Suzuki released the 2-door SUV X-90 and a revised Sidekick Sport model with dual airbags, a 95 hp (71 kW) 1.6 liter engine, 15 inch wheels. The Sidekick was replaced by the Vitara and the Grand Vitara for 1999. The Grand Vitara would be Suzuki's first model with a V6-cylinder engine and available 4-wheel ABS brakes. The XL-7 was introduced in 1998 as a stretched version of the Grand Vitara. The XL-7 had a larger 2.7 liter V6-cylinder engine and 3-row seating. This would be Suzuki's largest vehicle to date. The Swift was dropped from the model lineup in 2001 and the Esteem was replaced in 2002 by the new Aerio, which was offered as a 4-door sedan and 5-door crossover with 4-wheel drive as an option. 2006 was the first year American Suzuki sold more than 100,000 vehicles in the United States. Suzuki redesigned the Grand Vitara in 2006 as well as introduced the all-new Suzuki SX4 and Suzuki XL7 in 2007. The Suzuki SX4 is produced as a joint venture with Fiat and the XL7 (notice the shortening of the name from Grand Vitara XL-7) was produced as a joint venture with GM at CAMI Automotive Inc. in Ingersoll. Suzuki put XL7 production on indefinite hiatus in mid-2009 due to low demand and subsequently sold off its share of CAMI back to GM later that year. Despite a difficult domestic US automarket, Suzuki kept pace with its 2007 sales numbers in 2008. In 2009 however, Suzuki sales dropped 48.5%, following a 17% sales drop in 2008. Suzuki did not import any 2010 model year street motorcycles into the US, with dealers instead relying on unsold stock from the 2009 model year. New street motorcycle models to the US resumed for the 2011 model year. In November 2012, Suzuki announced that its US division would file for bankruptcy and would stop selling automobiles in the United States. It plans to continue to sell motorcycles, ATVs, and marine products in the US. In ten months of 2012, Suzuki only sold 21,188 automobiles in the US. The combination of a strong yen and Suzuki's own limited offering of models has been blamed for the downturn. The Suzuki FX was the first car that was assembled by Pak Suzuki in Pakistan. Following the terms of the joint-venture agreement between Suzuki Motor Corporation of Japan (SMC) and Pakistan Automobile Corporation (PACO), Pak Suzuki Motor Company Limited (PSMCL) was incorporated as a public limited company in August 1983. The new company assumed the assets including production facilities of Awami Autos Limited. PSMCL started commercial operations in January 1984 with the primary objective of passenger cars, pick ups, vans and 4x4 vehicles. The groundbreaking ceremony of the company's green field automobile plant at Bin Qasim was performed by the then Prime Minister of Pakistan in early 1989. On completion of first phase of this plant in early 1990, in-house assembly Suzuki engines started. The new plant was completed in 1992, and Suzuki production was transferred to new plant – and three-box 1,300 cc Margalla car was also added to its range of production. In September 1992 the company was privatized and placed directly under the Japanese Management. At the time of privatization SMC increased its equity from 25% to 40% Subsequently, SMC progressively increased its equity to 73.09% by 31 December 2001. 1973 – 1 June, Suzuki Canada Ltd. was incorporated with offices at Downsview, Ontario. Product lines included motorcycles, parts and accessories to Suzuki dealers throughout Canada. 1974 – Vancouver branch office and warehouse inaugurated to service dealers in western Canada. 1980 – Autumn – Suzuki Canada began its automotive sales with the marketing and sales of four-wheel-LJ80 in eastern Canada. 1 November, the name of company changed from Suzuki Canada Ltd. to Suzuki Canada Inc.
1982 – Introduction of a line of Suzuki all-terrain vehicles (ATVs) in Canada. 1983 – Introduction of a line of Suzuki outboard motors in western Canada. 1 February 1983 – Western Branch moved to enlarged facilities in Richmond, British Columbia. 1984 – Began the sales of 'Suzuki Forsa' (Suzuki Cultus) automobile. 1986 – A $600 million Suzuki-GM joint venture CAMI Automotive Inc. announced for the manufacturing of vehicles. Production was set to begin in 1989 at Ingersoll, Ontario. 1987 – 25 January – Suzuki Canada Inc. moved to a new 110,000 sq ft (10,000 m2). head office and warehouse facility at Richmond Hill, Ontario. 1988 – Autumn – Suzuki began selling the CAMI-built 2-door Suzuki Sidekick. In 2013, Suzuki Canada announced that it would follow the US division and stop selling automobiles in Canada after the 2014 model year. Suzuki Canada will continue to provide parts and services to vehicles through dealer network, as well as selling motorcycles, ATV and outboard motors. Suzuki GB PLC are the manufacturer's agent and distributor of automobiles, motorcycles, ATV's and Marine engines in the United Kingdom with a head office based in Milton Keynes. A wholly owned subsidiary of the Suzuki Motor Corporation operates as Suzuki Cars (Ireland) Limited in Ireland. In 1963, Suzuki commenced official import of motor vehicles, in particular motorcycles, as Suzuki (Great Britain) Limited. During the 1970s and 1980s, Heron International sponsored the Suzuki factory racing team in Grand Prix motorcycle racing, with riders including Barry Sheene, Randy Mamola, Mick Grant and Rob McElnea. Then trading as "Heron Suzuki GB Limited", before becoming "Heron Suzuki Plc" in 1989. In 1994, Suzuki GB PLC emerged to take over distribution of all Suzuki products in the United Kingdom. 1–2, Utari, Shiratori-cho, Toyokawa-shi, Aichi. Volkswagen Rocktan (Suzuki SX4) – development suspended or cancelled due to the dispute between the companies. GSX-R/4 concept car was presented in 2001. It is fitted with a 1,300 cm3 (79 cu in) engine taken from the GSX1300R Hayabusa motorcycle in an attempt to split the difference, merging the posture of an automobile and the disposition of a sportbike (Suzuki had been particularly successful selling motorcycles in the United States). Its high-revving inline-four engine supplied about 175 hp to a bare-bones, two-seat roadster weighing less than 1500 pounds. Pixy + SSC concept was introduced at the 2007 Tokyo Motor Show. The Pixy is an enclosed three-wheel, single-seat personal transport pod, similar to the Toyota i-unit, and i-REAL, but dissimilar in that two Pixies can dock inside the SSC (aka Suzuki Sharing Coach) for highway driving. Electric power is generated by a hydrogen fuel cell and solar panels to drive the SSC carrier van, and to recharge the Pixy at the same time. Suzuki Concept X debuted at the 2005 North American International Auto Show as a significant departure in styling for a Suzuki mid-sized sport utility vehicle aimed at younger buyers in the North American market. This concept vehicle evolved into the second-generation XL7 introduced late in 2006. G70 appeared at the 2011 Tokyo Motor Show as the Regina, but was renamed before the 2012 Salon International de l'Auto and Auto China shows to signify that it met the goal of carbon dioxide (CO2) emissions no higher than 70g/km (and perhaps that Regina as a model name would be a marketing fiasco). The G70 is a concept for the next-generation global compact car, possibly replacing the Alto, and at 3,550 millimetres (140 in) long and 1,630 mm (64 in) wide with a weight of 730 kilograms (1,610 lb), the G70 is smaller and lighter than the Alto. It has an extremely economical 800 cubic centimetres (49 cu in), direct-injection turbo gasoline engine mated to a continuously variable transmission, and a claimed fuel mileage of 3.1 litres per 100 kilometres (91 mpg‑imp; 76 mpg‑US). Q-concept, first shown at the 2011 Tokyo Motor Show, is a bubble car like the MIT CityCar, Nissan Pivo or Toyota PM. Just 2,500 millimetres (98 in) in length, the Q-concept has its driver and one passenger riding in tandem but is more comfortable than a motorcycle, being enclosed and having seats instead of a saddle. Intended primarily for short trips (within 10 kilometres (6.2 mi)) it ought to be able to park in nearly any available space. Suzuki, has unveiled the iK-2 concept at the 2015 Geneva Motor Show. Suzuki shown the 4x4 mini SUV concept iM-4 concept at the Geneva Motor Show in 2015. Suzuki started manufacturing motorcycles in 1952, the first models being motorized bicycles. From 1955 to 1976 the company manufactured motorcycles with two-stroke engines only, the biggest two-stroke model being the water-cooled triple-cylinder GT750. A large factor in Suzuki's success in two-stroke competition was the East German Grand Prix racer Ernst Degner, who defected to the West in 1961, bringing with him expertise in two-stroke engines from the East German manufacturer MZ. The secrets Degner brought with him were the work of Walter Kaaden, who combined three crucial technologies for the first time: the boost port, the expansion chamber, and the rotary valve. Suzuki hired Degner, and he won the 50 cc class FIM road racing World Championship for them in the 1962 season. Suzuki became the first Japanese manufacturer to win a motocross world championship when Joel Robert won the 1970 250 cc title. In the 1970s, Suzuki established themselves in the motorcycle racing world with Barry Sheene Marco Lucchinelli1981 Franco Uncini1982 winning world championships in the premier 500cc class. In 1976 Suzuki introduced its first motorcycles since the Colleda COX of the 1950s with four-stroke engines, the GS400 and GS750. Suzuki continued to compete in MotoGP and last won the title in the 2000 season. From 2006 to 2011, the team was sponsored by Rizla and was known as Rizla Suzuki MotoGP team. On 18 November 2011, Suzuki announced that the GP racing was suspended, partly due to natural disasters and recession, until 2014. Suzuki returned to MotoGP in 2015. In addition Suzuki have recorded a total of 93 victories at the Isle of Man TT Races. Suzuki have also taken the runner up spot in the various race categories 100 times and a total 92 third places. X6 Hustler twin (aka T20 Super Six) was sold from 1966 to 1968 as "the fastest 250cc motorcycle in the world". It had Suzuki's new Posi-Force automatic oil injection system (later called Suzuki CCI). Production peaked at more than 5000 units per month. In 2013, Suzuki renewed the Hustler motorcycle trademark for Europe, leading to rumors of a retro style 250 twin. A 1967 T20 Super Six was included in the Las Vegas show of The Art of the Motorcycle exhibition. T500 Titan (aka T500 Cobra, GT500) had a 500 cc air-cooled parallel-twin engine which overcame problems with durability, overheating and vibration. With an output of 47 metric horsepower (35 kW) at 6,500 rpm and top speed of 180 kilometres per hour (110 mph), it became Suzuki's flagship machine in 1968, and remains popular with collectors and café racers. GT750 Le Mans with a straight-three engine was the first Japanese motorcycle with a liquid-cooled engine, earning it the moniker "Water Buffalo." 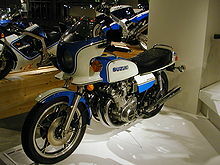 The Society of Automotive Engineers of Japan (in Japanese) includes the 1971 Suzuki GT750 as one of their 240 Landmarks of Japanese Automotive Technology. TM400 Cyclone production motocrosser was designed to participate in 500cc class Motocross World Championship racing. Introduced in 1971, it was notoriously difficult even for skilled riders to control. Redesigned in 1975. The RM125 production motocrosser debuted in 1975 to replace the TM125. It was a successful forerunner of the future RM series line-up from 50cc to 500cc. RM250 was fully redesigned in 1982 and the liquid-cooled single-cylinder delivered more power than any production 250cc motorcrosser of the time. It had Suzuki's original full floater, link-type rear suspension introduced a year earlier. RG250 Gamma of 1983 was one of the new generation of race replica sport bikes of the 1980s. It had an aluminum frame, a full fairing and a high output straight-twin engine. The 1983 RG250Γ is one of the JSAE 240 Landmarks of Japanese Automotive Technology. RG500 Gamma of 1985 was like RG250, but with a square-four engine. RGV250 Gamma, the road-racing replica of Kevin Schwantz's RGV500 GP race bike, replaced the RG250 in 1988 with a V-twin engine. GS series – The 1976 GS750 was the first 4-stroke machine released by Suzuki in 20 years. The following year saw Suzuki's first 1-liter machine, the GS1000E, and then in 1979 the GS1000S copy of a Yoshimura GS1000 Superbike. Katana – The GSX1100S was released in Europe in 1980; the GSX1000S arrived in the U.S. and Canada later that year as a 1981 model, and revolutionized sportbike styling. A 1982 Katana GS1000SV is on the AMA Motorcycle Hall of Fame's list of "classic bikes" that have been shown in the museum, and was in The Art of the Motorcycle exhibition. GSX-R750 was one of the Japanese sport bikes of the 1980s that began the modern race replica era. It had air/oil cooling, light weight, and a powerful engine. The Society of Automotive Engineers of Japan (in Japanese) includes the 1984 Suzuki GSX-R750 as one of their 240 Landmarks of Japanese Automotive Technology, and was in The Art of the Motorcycle. Intruder 750 with its OHC 4-valve 45° V-twin engine was the first Japanese cruiser motorcycle (designed to appeal to U.S. riders) in 1985. By 1997, cruiser-style motorcycles would account for nearly 60 percent of the U.S. street-bike market. GSX-R1100, related to the GSX-R750, appeared in 1986. The same basic engine would reappear in 1995 to power the Bandit 1200 and remain in production through 2006. The DR-BIG aka Desert Express DR800S (in German) off-roader was existent for two model years as the DR750S (in German) until 1990, when its displacement increased to 779cc, still the world largest single cylinder engine in a production motorcycle. Available in Europe through 1999, it was not exported to the U.S. market. Replaced by the V-Strom twin, the DR-BIG has now come full circle as the design inspiration for a 2014 overhaul of the V-Strom 1000 ABS. Suzuki RF Series The Suzuki RF series are sport touring motorcycles. They came with three engine variations: 400, 600 and 900 cc. It was in production from 1994 to 1998. TL1000S debuted at the 1996 International Motorcycle and Scooter Show as the first Suzuki sport bike with a V-twin engine. This was a liquid-cooled, 90° V-twin, DOHC engine with 4 valves per cylinder, which would be in production through 2012. Although the TL1000S motorcycle ceased production in 2001, the engine would carry on in the TL1000R, the SV1000 and SV1000S, as well as the V-Strom 1000. GSX-R600 – a smaller version of the GSX-R750. There were earlier pretenders, but the genuine article arrived in 1997 and has received frequent updates after that. Hayabusa (GSX-1300R) was introduced in 1998, and remains Suzuki's flagship sport bike. The 1998 Suzuki Hayabusa is included in the JSAE 240 Landmarks of Japanese Automotive Technology. The development of a second generation Hayabusa for the 2008 model year facilitated the 2007 roll-out of the GSX-1300BK B-King, a highly stylized naked variant. SV650 was introduced in 1999 as a budget entry in the naked bike market, and since 2001, offered both naked and fully faired. In 2009 the naked bike version was redesigned and renamed the Gladius in keeping with the sword motif Suzuki established with the Katana. The Gladius motorcycle won a Good Design Award (aka G Mark) from the Japan Institute of Design Promotion. GSX-R1000 – This top-of-the-line superbike debuted in 2000, and remains the largest model of the GSX-R series. Burgman 650 (AN650) was the largest of a series of urban scooters produced in Japan (marketed as Skywave domestically) as well as in Italy and Spain with engine capacities of 125cc and up. When it appeared in 2002 the 650 was the largest-displacement scooter in the world, and first two-wheel vehicle to have an electrically controlled Continuously Variable Transmission. The Japan Institute of Design Promotion awarded the G Mark Good Design Award to the Skywave 650 in 2003, to the entire Skywave series in 2006 and to the updated Skywave 650LX in 2013. Choinori was a lightweight, inexpensive, 50cc scooter and the antithesis of the Skywave 650, but they were introduced at the same time in an effort to increase domestic sales in response to shrinking motorcycle exports. The 2002 Choinori is one of the JSAE 240 Landmarks of Japanese Automotive Technology. The Choinori was awarded the G Mark Good Design Award in 2003. Boulevard M109R (VZR1800) V-twin, dubbed the Intruder M1800R in Europe, arrived in 2006 boasting a 112 mm (4.4 in) bore with a 90.5 mm (3.56 in) stroke, amongst the largest gasoline engine pistons ever used in any production motorcycle (or passenger car). GSX-650F – introduced in 2008, this new sport touring model fills the void of the retired Katana. The 2009 model has ABS standard. GSX-250F Across – a small 250 cc engine sport touring motorcycle produced from 1990 until 1998. It is mostly known as a practical sports/touring bike, due to its rear petrol tank and a fully enclosed helmet storage area where the petrol tank usually is. Suzuki GSX-R250 – a motorcycle that was manufactured from 1987 to 1994. A couple of years after the presentation of the GSX-R750 the 250 cc GSX-R250 was released. Like the larger bike, the GSX-R250 had a box-frame (steel, not aluminum), full fairing, full-floater rear swing and a four-cylinder four-stroke engine. But while the GSX-R750 engine was air and oil-cooled, the baby brother had a liquid-cooled engine. Not many examples are seen outside Japan. 17-inch cast wheels and 300 mm twin disc brake at the front. The GSX-R250 had impressive power and was made primarily as a road legal 250 cc racing bike reaching speeds of 200+km/h (124 mph). Imported specimens may be seen in Australia and New Zealand commonly. Also, around 350 units were exported to Denmark around 1989 to 1992. RE5 was the first (and only) Japanese motorcycle produced with a Wankel rotary engine. That, and its Giugiaro styling, make it one of the oddest and most collectible motorcycles of the 1970s. The 1974 RE5 is one of the JSAE 240 Landmarks of Japanese Automotive Technology, and a 1976 model is in the AMA Motorcycle Hall of Fame. Burgman Fuel-Cell Scooter uses electric-motor propulsion, powered by an air-cooled hydrogen fuel cell; its only emission is water. Following on a concept model at the 2009 Tokyo Motor Show, in 2011 the Burgman Fuel-Cell Scooter became the world's first fuel-cell vehicle to earn Whole Vehicle Type Approval (WVTA) in the European Union, enabling the vehicle to be sold in all member states. Suzuki is working toward commercial production of this scooter. Falcorustyco concept model at the 1985 Tokyo Motor Show envisaged the motorcycle technologies that might be brought into play by 1995, including a 4-cycle square 4-cylinder 500 cc engine, frameless body, front-and-rear swingarm suspension, center hub hydraulic power steering, chainless hydraulic drive and pop-up screen cowling. Nuda was a full-time two-wheel drive prototype, incorporating power steering and a swing seat, in a carbon fiber honeycomb monocoque body, shown at the 1986 Tokyo Motor Show. Nuda concepts influenced the design of the Suzuki Hayabusa. B-King – The concept model was well received by the public when it went on display at the 2001 Tokyo Motor Show. The addition of a turbocharger to the GSX1300R engine testified to massive power output, while electronics such as cellphone and GPS were stowed in the ultra-modern angular bodywork. The production model appeared six years later, largely unchanged except for its naturally aspirated engine. B-King styling is reflected in the award-winning design of the GSR600 and the GSR750, as well as the Inazuma GW250 and GW250S. G-Strider concept model with 916 cc engine, made public at the 2003 Tokyo Motor Show, was a half-scooter, half-cruiser (motorcycle) mash-up with an electrically controlled Continuously Variable Transmission incorporating a push-button manual mode, similar to the Burgman 650. Accentuating luxury, the G-Strider's handlebars, footrests, seat backrest, passenger backrest and windscreen were all electrically adjustable while under way to ensure the most comfortable riding position possible. 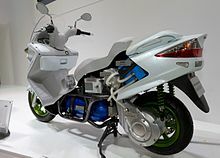 Stratosphere prototype was shown at the Tokyo Motor Show in 2005, with an 1100 cc engine pushed to the limits of space-saving design, resulting in an in-line six-cylinder as wide as a conventional in-line four-cylinder engine. Hammered aluminum and Damascus steel incorporate material characteristics into styling design. Prospects for a production model seemed good, considering that Suzuki's previous significant concept motorcycle, the B-King had made it into production, but the market changed before Stratosphere got the go-ahead. Biplane was a blue-sky concept announced at the 2007 Tokyo Motor Show, designed to convey the joy of two-wheel mobility, inspired by the feeling of flying an airplane. Its shape generates a feeling of openness in a modern machine powered by a V-four engine. Crosscage concept model was displayed at the 2007 Tokyo Motor Show. Combining a high-performance secondary battery and a compact, lightweight air-cooled fuel-cell system from British specialist company Intelligent Energy enabled quick activation with low fuel consumption. The lithium-ion battery assured reserve power as well as minimal environmental impact. Light weight not only made this bike environment-friendly but also sporty. Gemma prototype model was introduced at the 2007 Tokyo Motor Show. The distinctive "full-flat 2-seater," 250 cc four-stroke single-cylinder scooter is low and sleek and gives the rider and passenger feel a greater sense of intimacy. The luggage compartment in front of the rider holds a helmet. Gemma went into production in Japan the following year for the domestic market. 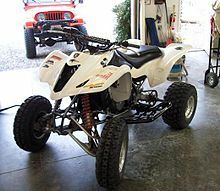 A 2004 LT-Z400 with custom modifications. Suzuki is a major sponsor of luge, biathlon, and cross country skiing sporting events. They are also the current title sponsor of ASEAN Football Championship, English League Two club Milton Keynes Dons and Italian Serie A club Torino. ^ a b "Reference for FY2012" (PDF). Suzuki Motor Corporation. 9 May 2013. Retrieved 21 August 2013. ^ a b c "Financial Results for FY2012" (PDF). Suzuki Motor Corporation. 9 May 2013. Retrieved 21 August 2013. ^ Suzukiis pronounced [sɯzɯki] in Japanese. It is pronounced /səˈzuːki/ sə-ZOO-kee in English, with a stressed zu. This pronunciation is used by the Suzuki company in marketing campaigns directed towards English-speakers. ^ "Cars are a sideline for Suzuki; sport-utes carry the load". Automotive News (5656). 29 April 1996. pp. S72(2). ^ a b "Twist the Throttle: Suzuki". Discovery Channel. Discovery Communications, LLC. Archived from the original (Video) on 2 January 2013. Retrieved 23 August 2013. ^ "VW and Suzuki settle four-year dispute". BBC. 30 August 2015. ^ "Suzuki buys back Volkswagen's stake for $3.8bn". BBC. 17 September 2015. ^ "Suzuki Motor Corporation". Google Finance. ^ Seth, Radhika (19 September 2012). "Adult adoptions makes perfect business sense". Japan Daily Press. Archived from the original on 17 October 2012. Retrieved 17 April 2013. Even the most prominent businesses like Toyota and Suzuki, camera-maker Canon and soy sauce firm Kikkoman have a tradition of adopting sons to continue the family business. The current chairman and CEO of Suzuki, Osamu Suzuki is the fourth adopted son in a row to run the company. ^ a b c d e "100 Years of Suzuki Excellence". The Auto Channel. 12 March 2009. Retrieved 5 October 2013. ^ a b c "Suzuki Motorcycles – The GS Papers – From GS To GSX-R". Motorcyclist Magazine. 1 April 2007. Retrieved 5 October 2013. ^ a b Atiyeh, Clifford (12 July 2012). "Is Suzuki Quitting the U.S. Car Market?". MSN Autos. Microsoft. Retrieved 21 August 2013. Suzuki's American division, famous for motorcycles and ATVs, is struggling mightily to sell cars. ^ McClearn, Matthew (19 April 2013). "The Ode: North American Suzuki cars (1980–2013)". Canadian Business. Retrieved 21 August 2013. American Suzuki filed for bankruptcy on 5 November 2012. Suzuki Canada scrambled to reassure dealers, employees and customers it would drive safely past the wreckage. That was wishful thinking. ^ a b c d e f g h i j k l m n o p q r s "History 1909–". Global Suzuki. Suzuki Motor Corporation. Retrieved 18 August 2013. ^ a b c d "Products History 1950s". Motorcycle – Global Suzuki. Suzuki Motor Corporation. Archived from the original on 6 October 2013. Retrieved 18 August 2013. ^ "Suzulight SS". 240 Landmarks of Japanese Automotive Technology. Society of Automotive Engineers of Japan, Inc. Archived from the original on 2 October 2013. Retrieved 12 September 2013. This was Japan's first proper 4-wheeled minicar. It was released in October 1955 with a 2-stroke, 360 cc engine. The 'Suzu' of the name was an abbreviation of its manufacturer, Suzuki, and 'light' indicated both the nimble operation of the car and evoked an image of illumination. The Suzulight was the first Japanese vehicle to successfully mount a 2-stroke engine in a 4-wheeled car, and it was also the first wholly Japanese vehicle to use a front-engine front-wheel drive set up. ^ a b c English, Bob (13 August 2009). "Suzuki celebrates its 100th anniversary". MSN Canada. Retrieved 25 August 2013. Given the current global economic downturn, all bets are off on reaching its sales target, but Suzuki's Canadian operation is currently operating with the throttle wide open nevertheless. ^ a b Mizukawa, Yuki (2012). 二輪自動車産業における寡占体制形成 [Oligopolistic structure formation in the motorcycle industry]. Economic Bulletin of Senshu University (in Japanese). Tokyo, Japan. 47 (1): 75. ^ a b "Toyokawa Plant". Global Suzuki. Suzuki Motor Corporation. Archived from the original on 24 October 2013. Retrieved 5 September 2013. 1–2, Utari, Shiratori-cho, Toyokawa-shi, Aichi. ^ a b c "Racing History 1960s". Motorcycles – Global Suzuki. Suzuki Motor Corporation. Archived from the original on 8 March 2014. Retrieved 19 August 2013. ^ "TT 1962". The official Isle of Man TT website. Isle of Man Department of Economic Development. Retrieved 24 August 2013. The two-lap 50cc race was regarded as a bit of a giggle by some cynics, but they could not have been proved more wrong as the Grand Prix battles between Suzuki, Honda and Kreidler spilled on to the Mountain Course. ^ "TT 1963". The official Isle of Man TT website. Isle of Man Department of Economic Development. Retrieved 24 August 2013. History was made in the 50cc race, which was increased to three laps after the previous year's success. ^ Wilson, Byron (20 August 2013). "Suzuki Celebrates 50 Years in America at Indy". Motorcycle USA. Retrieved 23 August 2013. Suzuki was in a unique position though. In addition to celebrating its 50th year in 2013, it also saw the end of automobile production in the States following approval of bankruptcy filings in March. ^ "Suzuki Fronte 800". 240 Landmarks of Japanese Automotive Technology. Society of Automotive Engineers of Japan, Inc. Archived from the original on 2 October 2013. Retrieved 12 September 2013. Frontes were exhibited at the Tokyo Motor Show from 1962 to 1964, and the 800 cc class small passenger vehicle that was shown as an R & D vehicle was eventually released as the Fronte 800 in 1965. It featured a water-cooled 2-stroke 785 cc power plant and a front-engine front-wheel drive set up mated to a 4-speed transmission that propelled the car to a top speed of 115 km/h. Its styling was ahead of its time, which assured its favorable reception. ^ a b "Products History 1960s". Motorcycle – Global Suzuki. Suzuki Motor Corporation. Archived from the original on 4 October 2013. Retrieved 18 August 2013. ^ "Iwata Plant". Global Suzuki. Suzuki Motor Corporation. Retrieved 5 September 2013. 2500, Iwai, Iwata-shi, Shizuoka. ^ a b "Kosai Plant". Global Suzuki. Suzuki Motor Corporation. Retrieved 5 September 2013. 4520, Shirasuka, Kosai-shi, Shizuoka. ^ a b c d e f g h i j "History 1970–". Global Suzuki. Suzuki Motor Corporation. Retrieved 18 August 2013. ^ "Meetings – The official Isle of Man TT website". TT 1970. Isle of Man Department of Economic Development. Retrieved 24 August 2013. ^ "History of Suzuki 4x4: 1970". Global Suzuki. Suzuki Motor Corporation. Retrieved 26 August 2013. ^ a b c d Parry, John (4 June 2010). "Jimny the giant killer turns 40". The Weekly Times. Retrieved 4 September 2013. The original Jimny, the LJ10, was unveiled in Japan in 1970 – although it first appeared in Australia in 1974 as the LJ20, powered by a 360cc water-cooled two-stroke engine. ^ a b "Suzuki GT750". 240 Landmarks of Japanese Automotive Technology. Society of Automotive Engineers of Japan, Inc. Archived from the original on 6 February 2012. Retrieved 12 September 2013. This motorcycle had a water-cooled, 2-stroke, 3-cylinder engine that provided good acceleration over a wide speed range from low to high. Technologies developed for Grand Prix racing were incorporated into the body structure and brakes. Easily visible meters and other features were also provided. ^ a b c d e f "Products History 1970s". Motorcycle – Global Suzuki. Suzuki Motor Corporation. Archived from the original on 6 October 2013. Retrieved 18 August 2013. ^ "Racing History 1970s MX". Motorcycles – Global Suzuki. Suzuki Motor Corporation. Archived from the original on 11 November 2007. Retrieved 19 August 2013. ^ a b "Suzuki RE-5". 240 Landmarks of Japanese Automotive Technology. Society of Automotive Engineers of Japan, Inc. Archived from the original on 2 October 2013. Retrieved 12 September 2013. This masterpiece of ambition was equipped with a water-cooled, single-rotor Wankel rotary engine. The RE-5 gained popularity all over the world for its completely unique design by Giorgetto Giugiaro, as well as its peripheral port system and twin mufflers. ^ "Suzuki Philippines Incorporated". Company. Suzuki Philippines Inc. Retrieved 25 August 2013. Since 1959, Suzuki came into the Philippine motoring scene through the able management of Rufino D. Antonio and Associates Inc wherein they handled nationwide distribution of Suzuki motorcycles. ^ "History of Suzuki 4x4: 1975". Global Suzuki. Suzuki Motor Corporation. Retrieved 26 August 2013. ^ a b c "Company Milestones". Pak Suzuki Motor Co. Ltd. Archived from the original on 24 September 2011. Retrieved 14 September 2013. ^ a b "Suzuki considers turning out vehicles in Pakistan". Nihon Keizai Shimbun. Tokyo: 7. 7 October 1980. ^ a b "Endurance and Superbike Racing History". Global Suzuki. Suzuki Motor Corporation. Archived from the original on 9 March 2014. Retrieved 26 August 2013. ^ "History of Suzuki 4x4: 1977". Global Suzuki. Suzuki Motor Corporation. Retrieved 26 August 2013. ^ "GM ties with two Japanese car makers". Nihon Keizai Shimbun. Tokyo: 1. 18 August 1981. ^ "Suzuki's New Australian Home". AutoWeb News. 1 March 1998. Archived from the original on 22 March 2012. Retrieved 2 September 2013. Marking a new beginning for the giant Japanese car, motorcycle and marine manufacturer in Australia, the new purpose-built complex will be in Melbourne rather than Sydney, the company's home for 18 years. ^ a b c d e f g h i j k l m n o "History 1980–". Global Suzuki. Suzuki Motor Corporation. Retrieved 18 August 2013. ^ a b c d e "Products History 1980s". Global Suzuki. Suzuki Motor Corporation. Archived from the original on 2 January 2015. Retrieved 2 September 2013. ^ "G.M., SUZUKI AND ISUZU AGREE TO 'MINI-CAR' DEAL". The New York Times. 13 August 1981. Retrieved 2 September 2013. The companies hope to gain an edge in the increasingly competive [sic] market for small, fuel-efficient cars with an engine displacement of 1,000 cubic centimeters and under. The agreement provides for each of the three companies to acquire shares in the other companies and to offer mutual technological and marketing assistance. ^ Neff, John (17 November 2008). "GM selling remaining Suzuki stake for $230M". Autoblog. AOL Inc. Retrieved 2 September 2013. GM has held an equity stake in Suzuki since 1981, when it purchased approximately 5.3 percent of the Suzuki shares outstanding. GM's stake was diluted to 3.5 percent in subsequent years, but in 1998 GM increased its holding in Suzuki to 10 percent, and to slightly over 20 percent in 2001. In 2006, GM sold a 17.4 percent stake in Suzuki. ^ a b "Racing History 1980s". Motorcycles – Global Suzuki. Suzuki Motor Corporation. Archived from the original on 7 February 2012. Retrieved 19 August 2013. ^ "1981 – 1995 Suzuki Samurai". MSN Autos Canada. Microsoft. Retrieved 3 September 2013. Though the Samurai wasn't the first Suzuki off-roader to be sold in Canada, it was more popular. Arriving in 1981, the rugged and affordable ute quickly became popularity. Unfortunately its high centre of gravity and quick steering made it prone to rollovers. Sales ended in Canada in 1989, but continued in the U.S. until 1995. ^ "History of Suzuki 4x4: 1981". Global Suzuki. Suzuki Motor Corporation. Retrieved 3 September 2013. In 1981 Suzuki continued to enjoy a developing level of success in the domestic market, but it was with the export of the SJ410 that the company really broke into new markets. ^ "World Championship Motocross Racing/All Japan Road Race & Motocross History 1980s". Motorcycles – Global Suzuki. Suzuki Motor Corporation. Archived from the original on 26 September 2009. Retrieved 19 August 2013. ^ Jacob, Jijo (9 January 2008). "CHRONOLOGY-Maruti Suzuki to launch world models from India". Reuters. Retrieved 11 September 2013. Suzuki Motor Corp owns 54.2 percent in Maruti Suzuki India Ltd, India's leading car maker. ^ "Pak Suzuki Motor Company". Business Recorder. 29 August 2013. Retrieved 7 September 2013. Pak Suzuki Motor Company Limited (PSMCL) is a public limited company that was formed in 1983 as a joint venture between Pakistan Automobile Corporation Limited and Suzuki Motor Corporation Japan. A year later, the Company started its operations, which were initially limited to the assembly and marketing of Suzuki FX. ^ "Suzuki to double auto production in Pakistan". Nihon Keizai Shimbun. Tokyo: 10. 20 November 1984. ^ Khan, Baber (19 September 2010). "The legacy of Suzuki Mehran". The Express Tribune. Retrieved 7 September 2013. Years ago some clean shaved kind hearted Japanese men come down to Karachi – better known as the ‘city of no-lights' located in the ‘country of no-lights' with the same aim as Tata. 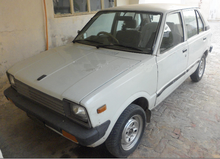 In 1982 Awami Auto Limited began the production of the Suzuki SS80 or Suzuki FX as we call it and the very next year Awami Autos Ltd was renamed Pak Suzuki Motor Company Ltd which in 1988 ceased the production of FX and brought in the second generation Suzuki Alto which in Pakistan is called Mehran. ^ Elmer, Matthew. "1982 Suzuki LT125". MSN Autos Canada. Microsoft. Retrieved 4 September 2013. While the public was still enamoured with the three-wheel layout, Suzuki figured a fourth wheel couldn't hurt. While three-wheelers are nimble and agile, their triangular arrangement made them prone to rollover accidents. The fourth wheel dramatically reduced the risk of toppling over, creating what we recognize today as an ATV. ^ a b "Suzuki RG250 Gamma". 240 Landmarks of Japanese Automotive Technology. Society of Automotive Engineers of Japan, Inc. Archived from the original on 6 February 2012. Retrieved 12 September 2013. The Suzuki RG250G was the dream machine of road bikes, developed using technologies that Suzuki had accumulated on the Grand Prix racing circuit. Every imaginable technology was packed into the machine, including the first aluminum square-pipe frame in the world to be used on a mass-market motorcycle. ^ McGrew, Jonathan (25 January 2010). "Suzuki To Make Swift Return In 2011". Green Car Reports. Retrieved 7 September 2013. The last time the American market saw a Suzuki Swift was in 2001. Some of you might not remember the Swift, but you might recall its very close cousin the Geo Metro. The Suzuki Swift was originally named the Suzuki Cultus and first introduced to the Japanese market in 1983. From 1983 on, the Cultus was marketed in seven countries under several different nameplates, the best-known of which were Suzuki Swift and Geo Metro. Since 2001 we have been without the Swift nameplate, but recent news has pointed to the return of the Suzuki Swift for 2011. ^ AP (3 April 1984). "Suzuki Ships Cars to G.M." The New York Times. Retrieved 9 September 2013. The first shipload of 900 fuel-efficient, 60-horsepower cars, called the Cultus, left for the United States from central Japan on Sunday, he said. G.M., which owns 5 percent of Suzuki and helped develop the car, wanted to import up to 100,000 of the cars a year. But because the cars are Japanese-made, they fell under that country's United States import quotas and the government allowed G.M. only 17,000. ^ "History of Suzuki 4x4: 1984". Global Suzuki. Suzuki Motor Corporation. Retrieved 9 September 2013. ^ a b Brown, Warren (26 May 1988). "Suzuki Samurai". Orlando Sentinel. Retrieved 9 September 2013. When the Suzuki Samurai entered the United States in late 1985... its ride was brutal. Its handling at highway speeds was frightening. And it was noisy... Today the Samurai is selling at the impressive rate of 8,000 vehicles per month, largely to younger buyers, 25 and under. It's also appearing before a growing number of juries in court cases stemming from roll-over accidents... Suzuki says its first-generation Samurai vehicles are safe. The plaintiffs disagree. Presumably, the courts will decide who's right. What's certain is that the 1988 1/2 Samurai is superior to those earlier models that have brought Suzuki so much fortune, fame and trouble. ^ a b Holusha, John (3 September 1988). "Suzuki Samurai Vehicles Set Record Sales in August". The New York Times. Retrieved 9 September 2013. Samurai sales, which had been running at 5,000 to 6,000 a month for the first five months of the year, dipped to 2,199 in June after the Consumers Union report. American Suzuki, which is owned by the Suzuki Motor Company of Japan, heatedly denied the accusation and offered a $2,000 cash incentive to its dealers – a very substantial amount on a vehicle with a base price of $8,495. That allowed dealers to cut prices aggressively, and at the same time Suzuki increased its advertising. ^ a b "Suzuki GSX･R750". 240 Landmarks of Japanese Automotive Technology. Society of Automotive Engineers of Japan, Inc. Archived from the original on 6 February 2012. Retrieved 12 September 2013. The Suzuki GSX-R750 came onto the market equipped with the styling and mechanisms of endurance-racing motorcycles. Suzuki incorporated into this mass-market vehicle technologies that it had developed through its racing experience, and it became a best-seller in the 750 cc class. ^ "JAPAN: Suzuki's Alto minicar hits 4 million mark". just-auto.com. 8 August 2001. Retrieved 12 September 2013. Sales reached one million in 1985 and the three million mark was passed in 1993. However, expansion of Suzuki's subcompact lineup and the increasing popularity of RV-style subcompacts like Suzuki's own Type R slowed production of the Alto. ^ Horovitz, Bruce (20 August 1985). "Introducing Low-Price 'Samurai' in November : Suzuki to Market Jeep Competitor". Los Angeles Times. Retrieved 15 September 2013. Analysts said Suzuki will be the pioneer in the 'mini-sport utility' market, a segment in which the domestic companies have announced no plans to compete. The Big Three U.S. auto makers all sell full-size off-road vehicles, and American Motors has long been a major competitor with its Jeep line. ^ a b "Jinan Qingqi Motorcycle Co., Ltd". About Us. qingqi.com.cn. Retrieved 12 September 2013. JINAN QINGQI MOTORCYCLE CO., LTD.(JNQQ) was established in 1956, the headquarters is in Jinan City, Shandong Province, where the first civil motorcycle of China was made. Since 1985, Jinan QINGQI started to work with SUZUKI (JAPAN) technically, and manufactured the first scooter in mainland of China. Established the Joint Venture with SUZUKI in 1996, with PEUGEOT in 2006, and became the only company who has 2 different technical systems from both Europe and Japan. ^ "G.M., SUZUKI IN CANADA TIE". The New York Times. 28 August 1986. Retrieved 12 September 2013. Unlike three other Asian auto plants being built in Canada, the companies said they have agreed to abide by a treaty between the United States and Canada requiring greater Canadian content in cars produced here. ^ "MAZDA:1980–1989". History. Mazda Motor Corporation. Retrieved 12 September 2013. ^ a b Krebs, Michelle. "Suzuki's Grand Vitara, a Granddaddy of SUVs, Shifts Gears". AutoObserver. Edmunds Inc. Retrieved 12 September 2013. But before the Toyota and Honda SUVs were even a gleam in product planners' eyes, Suzuki had virtually invented the compact soft-roader market with the 1988 debut of the Escudo in Japan and launched a year later in the U.S. as the Sidekick. ^ a b O'Dell, John (26 September 1989). "Samurai Sales Plunge Sparks Shuffle at American Suzuki". Los Angeles Times. Retrieved 12 September 2013. Also Monday, American Suzuki announced its 1990 automobile lineup. The Samurai is being de-emphasized, with fewer models and options being offered. Meanwhile, the Sidekick—a squat version of the Samurai with a lower center of gravity, is being offered in several new configurations. As last year, there will be three models of the Swift. ^ a b c "Suzuki in Hungary". Magyar Suzuki Zrt. Retrieved 13 September 2013. ^ a b c d e f g h i j k l m "History 1990–". Global Suzuki. Suzuki Motor Corporation. Retrieved 18 August 2013. ^ "P.M. BRIEFING : Japanese Upgrade Mini-Vehicles". Los Angeles Times. 5 March 1990. Retrieved 13 September 2013. Japanese auto makers have started marketing mini-vehicles with upgraded standards, bolstering prospects for recovery of the mini-car market, industry sources said today. ^ Bohlen, Celestine (25 April 1991). "Suzuki Starts Joint Venture In Hungary". The New York Times. Retrieved 13 September 2013. The Suzuki Motor Corporation began the first major Japanese investment in Eastern Europe today, signing a joint venture project that will start producing hatchback passenger cars at a former Soviet military base in northern Hungary next year. The $235 million Magyar Suzuki plant, near the Danube River in the city of Esztergom, represents the largest single foreign investment in Hungary. ^ James B. Treece (22 September 1991). "Why Gm And Daewoo Wound Up On The Road To Nowhere". Bloomberg Businessweek. Retrieved 13 September 2013. Like its local rivals, Daewoo was looking more to the protected—and lucrative—domestic market, which bought 60% of all Korean-built cars in 1989, up from only 33% in 1987. But its rivals were introducing cars with newer technology. When GM balked at Daewoo's request for newer models to keep up, the Korean company inked a technology-sharing deal with Japan's Suzuki Motor Co.
^ "The Good Oil: A big deal in a small package". New Zealand Herald. 31 August 2013. Retrieved 13 September 2013. Looking like the runt of the litter from an unholy union between a Mazda MX-5 and a Dodge Viper, the Cappuccino was a rear-wheel drive convertible that featured a removable roof and roll bar and was powered by a mighty 657cc three-cylinder engine. It was produced from 1991 until 1997 and a few are still visible on local roads, but now it seems there is a rumour doing the rounds that Suzuki is considering reviving its little RWD hero for a launch in 2016! ^ a b "India's car market: Local hero". The Economist. 14 August 1997. Retrieved 14 September 2013. Under the terms of the joint venture, Suzuki and the government take turns in nominating MUL's managing director, for five years at a time. The present boss, Ravindra Bhargava, was Suzuki's choice. His term runs out this month, and the government and Suzuki cannot agree on his successor. The head of the Japanese firm, Osamu Suzuki, has been invited to India to help make the final decision. Even if a compromise is reached, this may be just a preliminary skirmish in a battle for control. ^ "Two-wheel Drive From Japan". Chicago Tribune. 11 July 1993. Retrieved 18 September 2013. Suzuki formed Wangjian Suzuki Motorcycle Co., owned 50 percent by Wangjiang Machine Building Plant, 35 percent by Suzuki and 15 percent by Nissho Iwai Corp., in last month to produce 7,500 250-cubic centimeter Suzuki motorcycles in the first year and 50,000 in the third year. ^ Tycho de Feijter (1 July 2013). "Suzuki Alto 20th Anniversary Edition hits the China car market". China Auto News. CarNewsChina.com. Retrieved 18 September 2013. The Suzuki Alto 20th Anniversary Edition has been launched on the China car market, price starts at 52.400 yuan and ends at 61.400 yuan. Best thing: it comes only in Pink! The pinky special edition celebrates the 20th birthday of the Chang'an-Suzuki joint venture that started making the second generation Suzuki Alto in June 1993. ^ "Suzuki Wagon R". 240 Landmarks of Japanese Automotive Technology. Society of Automotive Engineers of Japan, Inc. Archived from the original on 18 September 2011. Retrieved 12 September 2013. The Wagon R has a short bonnet and a tall body style. Featuring upright seats for ease of ingress and egress, its spacious passenger compartment accommodates 4 adults. It has a fully flat luggage compartment with a generous amount of space. The Wagon R has a highly rigid body and a wide field of vision and demonstrates its environmental consciousness by adopting the new R134a refrigerant. Named the 1993 RJC Car of the Year. ^ Hideko Takayama; George Wehrfritz (17 January 1999). "Japan's Mini Invasion". Newsweek. Archived from the original on 6 May 2012. Retrieved 18 September 2013. Suzuki called it the Wagon R. Launched in late 1993, Aoshima's creation became Japan's car of the decade. It accommodates four adults and luggage, and has seats that recline, fold flat into a bed or tuck away to maximize storage space. 'It's like a 4.5-tatami room,' marvels one Tokyo-based analyst, referring to the multifunctional spaces in small Japanese homes. Every Japanese minicar maker borrowed the Wagon R concept, and it appeared later in the two Mercedes designs, the A-class and the Smart. ^ "Maruti rolls out five millionth car". The Hindu. 28 April 2005. Retrieved 19 September 2013. The first Maruti vehicle, a Maruti 800, was rolled out on 14 December 1983. The first million was reached in March 1994 while the second million was completed in October 1997. The three millionth vehicle was rolled out in June 2000 while the four millionth vehicle was manufactured in April 2003, the last million being the fastest, coming in just two years. ^ Davison, Phil (11 March 1994). "Spanish town 'at war' with Suzuki_ Phil Davison writes from Linares on an upsurge of bitter anti-Japanese feeling". The Independent. Retrieved 19 September 2013. Last month, Suzuki, owners of 84 per cent of Andalusia's only car plant, Santana Motor, announced a 'suspension of payments' – its liquidity could not cover its short-term debts. It said it would not invest another peseta, that a new investor would have to come up with 38 billion pesetas (around pounds 190m) and that 60 per cent of Santana's 2,400 workers would have to go. ^ Dever, Paul (6 December 1996). "Suzuki Motorcycle and Truck Joint Venture Begins Operation". The Auto Channel. Retrieved 19 September 2013. The Associated Press reported that Suzuki Motor Corp.'s joint venture with Vietnam has started operating an assembly plant to make light trucks and motorcycles. The financial newspaper Investment said the factory, located in the Bien Hoa industrial zone north of Ho Chi Minh City, had set a production goal of 10,000 trucks and 30,000 motorcycles per year. The venture's product will be sold locally in Viet Nam and exported. ^ VNS (26 April 2012). "Suzuki turns first sod on factory project". Viet Nam News. Retrieved 19 September 2013. Viet Nam Suzuki Corp began to manufacture motorbikes at Binh Da factory in Dong Nai in 1996. ^ VIR. "Authorities suspicious of Suzuki tax scandal". VietNamNet Bridge. VietNamNet. Retrieved 19 September 2013. Suzuki has been operating in Vietnam since 1996 with the construction of a motorcycle and automobile plant in Long Binh Techno Park in Dong Nai Province. In 2006, it built a new motorcycle plant to meet demands from the expanding market in Vietnam with an annual output of 80,000 units, also in Long Binh Techno Park. ^ "Suzuki Wins Product Innovation Award at IMTEC 97". Recreational Boating Building Industry. Polson Enterprises. 25 September 1997. Retrieved 20 September 2013. ^ Dean Travis Clarke (16 July 1998). "What's New In Boat Engines". Orlando Sentinel. Retrieved 20 September 2013. Suzuki also qualifies as a four-stroke innovator, having won the American marine industry's top prize last year for its 65- and 75-horsepower models. Tests show that Suzuki has better acceleration than its competitors. In fact, Suzuki's engines have proved to be so good that the company now makes all the four-strokes for Outboard Marine Corp.'s Evinrude and Johnson lines. ^ Collings, Anthony (22 April 1997). "Suzuki accuses Consumer Reports publisher of rigging tests". CNN. Retrieved 9 September 2013. The auto manufacturer released what it said was evidence that CU, which publishes Consumer Reports magazine, rigged results in 1988 to make the vehicle look bad and boost magazine sales. ^ Peterson, Iver (23 April 1997). "Suzuki Says Testers Sought To Prove A Car Unsafe". The New York Times. Retrieved 9 September 2013. In its comment on roll-over standards, presented to the National Highway Traffic Safety Administration yesterday, the car maker included an affidavit from a former Consumers Union test mechanic that after the car failed to tip after several runs, a senior Consumers Reports editor in effect instructed the testers to find someone who could make the car go up on two wheels. Suzuki said a videotape of the test, obtained from Consumers Union under a court procedure, also reveals a car tester yelling, 'All right, Ricky baby!' when a Samurai driven by Richard Small tipped up in a test. ^ Mitra, Sumit (10 November 1997). "On a crash course". India Today. Retrieved 14 September 2013. In the ongoing wrestling bout between the Industry Ministry and Suzuki Motor Company (SMC) of Japan for the control of Maruti Udyog Limited (MUL), the Indian side has put its opponent on a half nelson. ^ "COMPANY NEWS; AUTO MAKER TO TRIPLE ITS STAKE IN SUZUKI MOTOR". The New York Times. 17 September 1998. Retrieved 11 September 2013. G.M. is strong in North America, Latin America and Europe, but it does not have a big presence in Asia. It hopes to use Suzuki as a springboard to increase its presence there. ^ "Government, Suzuki resolve Maruti row". Rediff On The Net. Rediff.com. 8 June 1998. Retrieved 14 September 2013. The government has signed a memorandum of understanding and settlement with the Suzuki Motor Corporation under which appointments of chairmen and managing directors of their joint venture, Maruti Udyog Limited, will be made only after mutual consultation. ^ "Changan Automobile Company Limited". Changan Suzuki Automobile Co., Ltd. Chongqing Changan Automobile Company Limited. Archived from the original on 21 September 2013. Retrieved 20 September 2013. Changan Suzuki Automobile Co., Ltd now has 4176 staffs, of which there're about 880 management and technology personnel. Changan Suzuki is mainly engaged in four products series: LingYang (came to market in June 1998); Swift (came to market in April 2005); TianYu SX4 (sedan) (came to market by the end of 2006) and SX4 (hatchback) (came to market in March 2007); new Alto (came to market in September 2009). ^ a b c "Suzuki drives back into Myanmar". Investvine.com. 8 February 2013. Retrieved 16 February 2013. ^ Miyazaki, Ken (9 March 2012). "Suzuki looks to restart business in Myanmar". Asahi Shimbun. Archived from the original on 21 September 2013. Retrieved 20 September 2013. The maker had produced motorcycles and small commercial vehicles in Myanmar under a joint company with a state-backed enterprise since 1998, when the country was ruled by a military government. ^ "Myanmar Suzuki Motor Co., Ltd". Businessweek.com. Bloomberg L.P. Retrieved 20 September 2013. Myanmar Suzuki Motor Co., Ltd. manufactures motorcycles, small passenger cars, and commercial vehicles. The company was founded in 1998 and is based in Yangon, Myanmar. Myanmar Suzuki Motor Co., Ltd. operates as a subsidiary of Suzuki Motor Corp.
^ a b Hyde, Justin (5 November 2012). "Suzuki leaves U.S. car business to focus on small vehicles elsewhere". Motoramic. Yahoo! Inc. Retrieved 9 September 2013. And after nearly 30 years on these shores, the company had failed to craft much of an identity among American consumers. In China, Malaysia and elsewhere, Suzukis are seen as cheap yet stylish transportation, an image that it could never build here. Suzuki's models were never top of their class in any particular measure; the 16-year battle with Consumer Reports over its pillory of the 1988 Suzuki Samurai didn't help. Among motorcycle enthusiasts, the Suzuki Hayabusa remains legend as the world's fastest production bike, but Suzuki never found a way to translate the enthusiasm for its two-wheeled products to those with four. ^ a b "Suzuki Hayabusa". 240 Landmarks of Japanese Automotive Technology. Society of Automotive Engineers of Japan, Inc. Archived from the original on 16 October 2013. Retrieved 16 October 2013. The Suzuki Hayabusa had a 1299 cc 4-cylinder DOHC engine, which employed the latest electronic fuel injection system. High-speed plated cylinders were used for the engine, and excellent piston cooling efficiency was achieved through the use of a compact and lightweight cylinder block and crankshaft. The multi-reflector low beam and projector high beam were characteristically laid out one above the other. Large air intakes to introduce boost pressure were laid out on both sides of the lights in locations that maximize running wind pressure. This contributed to greatly increased horsepower and torque. A large capacity clutch helped to realize fine gear engagement and light clutch feeling. The aerodynamic performance was optimized by an elaborate design around the cowling featuring a one-piece front fender, air intakes, and the like, as well as by optimal layout of the radiator and oil cooler. ^ O'Dell, John (12 December 1998). "American Suzuki Names New President". Los Angeles Times. Retrieved 2 October 2013. American Suzuki Motor Corp. has appointed longtime company executive Rick Suzuki as its new president. He had been president of CAMI Automotive Inc., an auto manufacturing joint venture of Suzuki Motor Corp. and General Motors of Canada. Suzuki will be responsible for directing all of Brea-based American Suzuki's operations, including its automotive, motorcycle and marine divisions. Suzuki began his career with Suzuki Motor Corp. in Japan in 1974. He joined Suzuki Canada Inc. in 1987 and was responsible for overseeing operations for all three divisions of the Canadian subsidiary. He launched Suzuki Motor's automotive division operations in Canada. ^ a b Krebs, Michelle (30 April 2008). "Rick Suzuki: Fall on Sword Justified?". AutoObserver. Edmunds.com. Retrieved 2 October 2013. In a March letter to employees, the 60-year-old Rick Suzuki wrote that he would step down 'to bear responsibility'&#157; for the automaker's poor sales and earnings. No timeframe was given for his departure. Chairman of American Suzuki since 1998, he is the grandson of Suzuki Motor Corp. founder Michio Suzuki. ^ Bowman, Bill. "GM Argentina". Generations of GM History. GM Heritage Center. Archived from the original on 4 April 2012. Retrieved 30 September 2013. ^ a b c "History 2000". Global Suzuki. Suzuki Motor Corporation. Retrieved 18 August 2013. ^ "TIMELINE: Key dates in General Motors' history". Reuters. 29 May 2009. Retrieved 30 September 2013. ^ a b "History 2001". Global Suzuki. Suzuki Motor Corporation. Retrieved 18 August 2013. ^ Terril Yue Jones (7 March 2001). "Jaguar Takes the Wraps Off the X-Type, Its $30,000 Make-or-Break Machine". Los Angeles Times. Retrieved 30 September 2013. Also unveiled in Switzerland for the Geneva show and likely to come to America: the Suzuki Liana, a five-door compact minivan-like vehicle known in Japan as the Aerio. The Liana, based on the Suzuki Esteem, will come in front-wheel-drive and all-wheel-drive configurations. ^ "Suzuki Liana". Fleet News. Bauer Automotive. 7 March 2001. Retrieved 30 September 2013. SUZUKI is claiming its new hatchback will bring unbeatable value to the compact business car sector when it is launched this month. Priced from £9,995 on-the-road, the Liana – short for Life In A New Age – is a five-door, five-seat model that has the potential to drive Suzuki into the heartland of the C segment by offering significantly higher perceived value than European market pacesetters like the Volkswagen Golf and Ford Focus. ^ Waters, Pattie (1 October 2002). "SMAC is Born – Suzuki Opens North American ATV Manufacturing Facility". Off-Road.com. VerticalScope Inc. Retrieved 2 October 2013. Suzuki Manufacturing of America Corporation (SMAC) was created in 2001 to establish Suzuki's first US manufacturing facility. SMAC will initially be building ATV's in it's [sic] 100,000 square foot manufacturing facility located on Technology Parkway in Rome, Georgia. ^ "History 2002". Global Suzuki. Suzuki Motor Corporation. Retrieved 18 August 2013. ^ a b "Suzuki Choinori". 240 Landmarks of Japanese Automotive Technology. Society of Automotive Engineers of Japan, Inc. Archived from the original on 13 October 2013. Retrieved 12 September 2013. The Suzuki Choinori was developed to be mainly used for short journeys for commuting and shopping. The appropriate engine output, body structure, and required functions were reviewed from the basic design phase in pursuit of mass reduction, rationalization of parts, and high quality. It achieved mass reduction of about 40% compared with a conventional scooter by reducing the size of parts, the application of a new engine, a newly designed frame, and by careful reduction of the number of plastic parts. Such rationalization, including a reduction in the number of parts tightened by nuts and bolts, enabled the Choinori to be sold at the low price of 59,800 yen. Colored resin was used for plastic parts to provide 6 body colors without the need for painting. A new high-speed cylinder plating technology was introduced for the newly developed 4-stroke engine to enable high-speed processing at low cost. This reduced the weight of the engine by about 40% compared with a conventional 50 cc engine. ^ "Suzuki Becomes a ``Made-in-America Manufacturer with Opening of Georgia ATV Plant". The Auto Channel. 31 May 2002. Retrieved 2 October 2013. ^ Swibel, Matthew (6 April 2007). "Hail, Rome!". Forbes. Retrieved 2 October 2013. Suzuki hired its first 60 production workers (24 of them with the Coosa Valley certification) in 2002 and another 100 last year. Production is running at 300 all-terrain vehicles a day, with a 0.2% manufacturing-defect rate and, so far, no injuries. ^ Kodack, Anthony (7 April 2008). "Suzuki Manufacturing Of America Celebrates 250,000 ATV Units". TopSpeed. Retrieved 2 October 2013. In May 2002, Suzuki Manufacturing of America Corp. (SMAC) opened in Rome, Ga., as Suzuki's only U.S.-based manufacturing facility and began producing the Eiger series of ATVs. Today, 300 SMAC employees are building ATV frames, molding plastic and assembling KingQuad 400s, 450s and 750s at a rate of more than 200 units in an eight-hour shift. Last year almost 60,000 quads came off the line. ^ a b "History 2003". Global Suzuki. Suzuki Motor Corporation. Retrieved 18 August 2013. ^ a b Nakamura, Akemi (18 April 2002). "Suzuki prepares a 'mini' blitz". The Japan Times. Retrieved 30 September 2013. In fact, the joint project between Suzuki and Fiat is one of the fruits of its relations with GM, which owns 20 percent stakes in both the Japanese and the Italian carmakers. ^ "History 2004". Global Suzuki. Suzuki Motor Corporation. Retrieved 18 August 2013. ^ Hyde, Justin (8 July 2013). "July 8: Consumer Reports settles the Suzuki Samurai case on this date in 2004". Motoramic. Yahoo! Canada Co. Retrieved 9 September 2013. Introduced to the United States in 1985, the Suzuki Samurai made an instant name for itself with a combination of bargain-basement pricing and real off-road ability, even if it only had 62 hp under the square hood. The good times ended a few years later when Consumer Reports ran the photo above, warning the Samurai 'easily' rolls over in sharp turns. That story sent Samurai sales plunging, and Suzuki filed a libel suit against the magazine in 1996, a year after halting Samurai sales in the face of tougher safety standards. ^ James F. Peltz (9 July 2004). "Suzuki, Consumer Reports Settle Case". Los Angeles Times. Retrieved 9 September 2013. The joint statement said Consumer Reports' use of the adverb 'easily' in describing the Samurai's tendency to roll over might 'have been misconstrued and misunderstood.' The magazine was referring to the results of 'severe turns' in certain tests and 'never intended to state or imply that the Samurai easily rolls over in routine driving conditions,' the statement said. ^ a b "75th Geneva International Motor Show". Global Suzuki News. Suzuki Motor Company. 1 March 2005. Retrieved 10 September 2013. This year&#129;'s show sees the European launch of the New SWIFT, which was previously premiered at the Paris Motor Show in 2004... We also introduce our recently established brand philosophy &#129;'Way of Life!&#129;' which is to put further emphasis on our customers and their individual ways of life with our products. It is also to show, with this phrase, our devotion to creating cars that will bring true customer satisfaction. ^ a b "History 2005". Global Suzuki. Suzuki Motor Corporation. Retrieved 18 August 2013. ^ "Press Release". Global Suzuki. Suzuki Motor Company. 1 March 2005. Retrieved 10 September 2013. The 2005 Geneva Motor Show presents the ideal opportunity to introduce both our new Swift compact, as well as our fresh new brand philosophy, which we&#129;fve chosen to call &#129;'Way of Life!&#129;' Like all our products, the Swift has been designed to deliver a driving experience with genuine worldwide appeal. ^ "Suzuki Cycles". Français. Suzuki Canada Inc. Archived from the original on 1 September 2013. Retrieved 11 September 2013. ^ "Suzuki Veículos do Brasil – Entre e divirta-se". Svb Automotores do Brasil Ltda. Retrieved 11 September 2013. ^ "第26回　日本カー・オブ・ザ・イヤー 2005–2006". COTY記録. CAR OF THE YEAR JAPAN. Archived from the original on 17 October 2013. Retrieved 10 September 2013. ^ Simona (29 March 2006). "Suzuki Expands Product Line With New Introductions At 2006 New York International Auto Show". TopSpeed. Retrieved 30 September 2013. Globally introduced at the Geneva Motor Show in March 2006, the Suzuki SX4 compact sport X-over with AWD will make its North American debut at the NYIAS. The all-new SX4 features a versatile, rigid five-door design, a standard all-wheel-drive system and for the U.S. market, a sophisticated fuel-sipping 2.0-liter DOHC engine. ^ "Suzuki XL7 CUV to Bow in N.Y." WardsAuto. Penton. 29 March 2006. Archived from the original on 2 October 2013. Retrieved 30 September 2013. The XL7 is based on General Motors Corp.'s Theta platform (Chevrolet Equinox, Saturn Vue, Pontiac Torrent). The XL7 will be built at Suzuki's CAMI Automotive Inc. joint venture with GM in Ingersoll, Ont., Canada, which last built a Suzuki vehicle in January 2004. CAMI also produces the Equinox and Torrent. ^ Amadon, Ron (14 October 2006). "2007 Suzuki XL7 Limited". MarketWatch. Archived from the original on 17 October 2013. Retrieved 30 September 2013. Suzuki still has a long way to go to become a household word as far as four-wheel vehicles go, but they're now better prepared to take on the big dogs with vehicles like the XL7. The trick is to get customers into their showrooms (and, as a corollary, for potential customers to find those dealers). ^ "History 2006". Global Suzuki. Suzuki Motor Corporation. Retrieved 18 August 2013. ^ "GM Sells 7.9% Stake in Isuzu". Los Angeles Times. 12 April 2006. Retrieved 30 September 2013. This month, GM sold 17% of Suzuki Motor Corp. for about $2 billion, leaving it with a 3% stake. That came after last year's sale of GM's 20% stake in Fuji Heavy Industries Ltd., the maker of Subaru cars. ^ "History 2007". Global Suzuki. Suzuki Motor Corporation. Retrieved 18 August 2013. ^ Ramesh, Randeep (11 December 2007). "Suzuki to make cars in India for export to Europe from next year". The Guardian. Retrieved 1 October 2013. For the first time, Suzuki sold more cars in India than in Japan during the first half of the fiscal year and by March 2009 will be making nearly 1 million cars a year in the country. ^ a b "Nissan to build Suzuki truck at Tennessee plant". NBCNews.com. Associated Press. 11 December 2007. Retrieved 1 October 2013. The announcement of the timetable for production of the Suzuki truck at Nissan's plant in Tennessee coincided Tuesday with Suzuki officials saying the company would build a new compact hatchback in India that will be sold worldwide. ^ "History 2008". Global Suzuki. Suzuki Motor Corporation. Retrieved 18 August 2013. ^ "GM will sell stake in Suzuki to raise capital". Los Angeles Times. Associated Press. 18 November 2008. Retrieved 1 October 2013. The Asian automaker will repurchase the shares for $230 million. ^ "Suzuki exhibits Equator midsize pickup truck at Chicago Auto Show". Suzuki Global News. Suzuki Motor Corporation. 14 February 2008. Retrieved 2 October 2013. ^ a b Mateja, Jim (25 January 2009). "Test Drive: 2009 Suzuki Equator, Grand Vitara". Chicago Tribune. Retrieved 2 October 2013. In the U.S., Suzuki is best known for motorcycles and all-terrain vehicles, with sales of more than 1 million units here the last five years, or about 10 times more than the cars it sells in the U.S. annually. ^ Mike Ramsey; Tetsuya Komatsu (31 March 2008). "Suzuki U.S. Chief Will Quit After Missing Sales Goal". Bloomberg. Retrieved 2 October 2013. Suzuki's U.S. auto sales rose less than 1 percent last year to 102,000, following three years of gains of at least 11 percent. In 2003, Rick Suzuki, the grandson of the company founder, predicted U.S. sales would reach 200,000 by the end of 2007. ^ "Suzuki USA CEO, Rick Suzuki Quits Over Poor Sales". Carscoops. 31 March 2008. Retrieved 2 October 2013. Unfortunately for ASMC employees, Rick Suzuki also wrote in the letter that due to the fact the company reported operating losses in 2007, it will reduce its U.S. work force of 674 by 55 employees through a voluntary retirement plan and that ASMC 'is in no position to provide any bonus, let alone pay raise this year'. ^ Gunn, Malcolm (17 October 2008). "2009 Suzuki Equator". The Commercial Appeal. Retrieved 2 October 2013. The Nissan Frontier is ideally suited as the basis for the Equator, which is scheduled to arrive later this year. It's compact dimensions (slightly larger than a Ford Ranger and just a touch smaller than the mid-size Toyota Tacoma) neatly fits Suzuki's small-car-focused lineup, yet its solid body-on-frame construction and impressive power from an available V6 give it tremendous versatility. ^ "Volkswagen and Suzuki agreed to establish a comprehensive partnership". Volkswagenag.com. 9 December 2009. Archived from the original on 5 June 2010. Retrieved 5 October 2010. ^ Hiroko Tabuchi; Bettina Wassener; Chris V. Nicholson (9 December 2009). "Volkswagen to Buy 20 Percent Stake in Suzuki". The New York Times. Retrieved 2 October 2013. In the deal, which is subject to regulatory approval and is expected to close in January, Volkswagen will purchase 19.9 percent of Suzuki's issued shares for ¥222.5 billion, or $2.5 billion. Suzuki will invest up to half of that amount received from Volkswagen into shares of Volkswagen. ^ "History 2009". Global Suzuki. Suzuki Motor Corporation. Retrieved 18 August 2013. ^ "History 2010". Global Suzuki. Suzuki Motor Corporation. Retrieved 18 August 2013. ^ "Volkswagen completes Suzuki tieup". Japan Times. 15 January 2010. Retrieved 16 January 2010. ^ "Suzuki eyes RI as production hub with $800 million project". Kontan.co.id. 22 June 2011. Archived from the original on 29 June 2011. Retrieved 19 August 2011. ^ "Suzuki s Rome plant celebrates 10th anniversary". Rome News-Tribune. 26 February 2011. Archived from the original on 4 October 2013. Retrieved 2 October 2013. Rod Lopusnak, U.S. sales manager, told the plant workers that of the 311,537 four-wheelers manufactured at the Rome plant, more than 260,000 have been sold in the U.S. 'The last two years have been very difficult on Suzuki and the whole U.S. economy, but the power sports business in general has been challenged like never before,' Lopusnak said. ^ "History 2011". Global Suzuki. Suzuki Motor Corporation. Retrieved 18 August 2013. ^ Harner, Stephen (15 November 2011). "The VW-Suzuki Split and Japanese Corporate Globalization". Forbes. Retrieved 2 October 2013. VW appears to have had a hidden agenda, which was to bring Suzuki into its group as an affiliate. Such an intention was revealed in VW's annual report published in March that listed Suzuki as a consolidated entity within the group. This 'Freudian slip' caused shockwaves in Hamamatsu and was the last straw for Chairman Suzuki. ^ "History 2012". Global Suzuki. Suzuki Motor Corporation. Retrieved 18 August 2013. ^ "Suzuki To Increase Presence in Indonesia". The Wall Street Journal. 4 January 2012. Retrieved 3 October 2013. For Suzuki, the new Indonesia plant is part of a campaign to expand rapidly in Asian markets outside Japan, and to solidify its lead in India. While the company remains committed to its home market, sluggish demand and intense competition there have led it—and most other Japanese auto makers—to seek growth abroad. The yen's rise to record highs against the dollar has made exports from Japan less competitive, so the makers are ramping up production elsewhere. ^ a b "Suzuki and IE to commercialize FC cars and bikes". Gizmag. 8 February 2012. Retrieved 26 October 2013. Given the rash of publicity that has been mounting around the already-certified, ready-to-go (Suzuki was granted Whole Vehicle Type Approval in March 2011 for the Burgman) Burgman FC scooter, it will almost certainly be the new company's first commercial product. ^ Deutsche Presse-Agentur (21 March 2012). "Suzuki launches Thailand-made eco car". The Nation. www.nationmultimedia.com Thailand. Retrieved 3 October 2013. The launch of the model, designed to run more than 20 kilometres per litre of fuel, followed a similar launch by Mitsubishi Motors Thailand of its new Mirage model on Tuesday. Five Japanese automobile manufacturers won tax privileges to design and produce compact, fuel-efficient passenger cars for the domestic and export market. ^ "Suzuki Motors to end US car sales amid growing struggle". BBC. 6 November 2012. Retrieved 17 April 2013. ^ Hirsch, Jerry (5 November 2012). "American Suzuki to file for bankruptcy, end U.S. auto sales". Los Angeles Times. Retrieved 2 October 2013. Suzuki said that its 'automotive division was facing a number of serious challenges,' including the low sales volume, a dearth of models, the unfavorable exchange rate between the U.S. dollar and the Japanese yen, the cost of the maintaining a dealership network and the regulatory environment for the automotive industry in the U.S.
^ Berkowitz, Justin (8 November 2012). "Suzuki Ends U.S. Car Sales: Why It Had to Do It (And Other Brands That Could Disappear)". Car and Driver. ^ W.J. Hennigan (7 November 2012). "Suzuki gives up on U.S. auto market". Los Angeles Times. Retrieved 2 October 2013. Unlike larger carmakers, the Japanese automaker failed to rebound from the recession as North American car sales plummeted 72% to 30,000 for the fiscal year that ended March 30 from a peak of 107,000 in fiscal year 2008. ^ a b Swarts, David (12 November 2012). 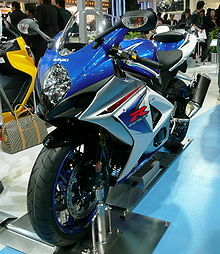 "Suzuki Confirms 1 Million Commemorative Edition GSX-R1000 Coming To America In 2013". Roadracing World. Retrieved 23 August 2013. ^ a b Wilson, Andrea (17 August 2013). "2014 Suzuki GSX-R 1000 SE First Look". Cycle News. Archived from the original on 22 August 2013. Retrieved 23 August 2013. The 50th anniversary Suzuki GSX-R1000 was launched in front of the media and Suzuki owners in the Suzuki hospitality today at Indianapolis Motor Speedway. ^ Kenzie, Jim (9 November 2012), "Suzuki Canada carries on", Wheels.ca website, Torstar, retrieved 10 November 2012, He needed to reassure everyone in his organization ... that it will be business as usual for Suzuki Canada: meaning many late-Monday-night phone calls and meetings, plus a media release indicating as much. ^ Keenan, Greg (26 March 2013). "Suzuki calls off 30-year drive in Canada". Auto Making. The Globe And Mail. The revenue from selling about 5,500 vehicles, as Suzuki did in Canada last year, do not come close to covering the costs of designing and developing vehicles for a market this size, along with meeting regulatory requirements that are different than those of the company's other large markets such as Japan and India. ^ Swan, Tony (6 March 2013). "2014 Suzuki SX4: Suzuki Still Produces Autos, Just Not for Us [2013 Geneva Auto Show]". Car and Driver. Retrieved 10 September 2013. Despite Suzuki's departure from the U.S. market, the company continues to be a player in other parts of the world, a fact underscored by the Geneva introduction of its new SX4 crossover. The SX4 has been one of Suzuki's most popular offerings, and the latest iteration continues to be a five-passenger vehicle, based on a front-drive unibody platform, but it's substantially bigger than the current model, with a much more contemporary look and upscale interior furnishings. ^ Press Release (1 April 2013). "American Suzuki Motor Corporation ("ASMC") Consummated Chapter 11 Plan and Sale of Assets to Suzuki Motor of America, Inc". Business Wire. Retrieved 17 October 2013. ASMC's Chapter 11 Plan was confirmed by Bankruptcy Judge Scott C. Clarkson of the U.S. Bankruptcy Court for the Central District of California in Santa Ana on 28 February 2013. The Chapter 11 Plan became effective on 31 March 2013, when ASMC closed its assets sale and commenced paying the claims in full of all consensually settling Automotive Dealers and trade creditors through the PE Creditor Trust established by the Plan. ^ Schwartz, Jan (29 July 2013). "Volkswagen, Suzuki resume alliance talks: sources". Reuters. Retrieved 3 November 2013. 'There have been talks at board level,' one of the people familiar with the matter told Reuters, a sign that the frosty relations between the two car makers may be thawing. ^ Kubota, Yoko (1 August 2013). "Suzuki denies reports it has resumed talks with Volkswagen". Reuters. Retrieved 3 November 2013. Suzuki Motor Corp (7269.T) Executive Vice President Toshihiro Suzuki denied recent media reports that it and Volkswagen (VOWG_p.DE) have resumed talks on how to resolve a dispute about a partnership deal. ^ Dyste, Leslie (23 October 2013). "Nissan, Suzuki Recall Thousands of Vehicles". KSTP TV. Retrieved 24 October 2013. The recall involves GSX-R600 and GSX-R750 motorcycles from the 2004 through 2013 model years and GSX-R1000 motorcycles from the 2005 through 2013 model years. ^ Jensen, Christopher (23 October 2013). "Nissan and Suzuki Issue Recalls for Braking Problems". The New York Times. Retrieved 24 October 2013. The motorcycle manufacturer says corrosion of the front brake piston may generate gas within the brake system, reducing stopping power. There was no mention of any accidents related to the problem. ^ The Earthtimes (9 January 2008). "Suzuki's A-Star concept in global debut at Delhi auto show : Cars General". Earthtimes.org. Retrieved 20 May 2009. ^ "Knowing Maruti Suzuki". Marutisuzuki.com. Retrieved 29 December 2012. ^ "Maruti Suzuki Monthly Sales". Marutisuzuki.com. Archived from the original on 26 January 2013. Retrieved 29 December 2012. ^ "Milestones". Archived from the original on 15 December 2007. ^ "Maruti Suzuki XA Alpha origins – Overdrive". Overdrive.in. 15 March 2011. Archived from the original on 25 February 2013. Retrieved 17 April 2013. ^ "Concept XA Alpha unveiled". Marutisuzuki.com. 5 January 2012. Archived from the original on 24 May 2013. Retrieved 17 April 2013. ^ a b Thomas, David (5 November 2012). "Suzuki Files Bankruptcy, Stops Selling Cars in U.S." Cars.com. Retrieved 5 November 2012. ^ a b "UPDATE 2-Suzuki to end car sales in U.S., focus on motorcycles". 5 November 2012. ^ "U.S. December 2009 Auto Sales". TheAutoChannel.com. Retrieved 19 April 2011. ^ Matrix Consultants, 323.766.0732. "Suzuki December 2008 Sales". Media.suzuki.com. Archived from the original on 16 July 2011. Retrieved 19 April 2011. ^ "Pak Suzuki Motor Company Limited :". Paksuzuki.com.pk. Retrieved 20 May 2009. ^ AP (4 December 2009). "Suzuki, General Motors to end Canada partnership". The Hindu. Suzuki said on Friday it will sell its 50 percent stake in CAMI Automotive Inc. to GM for an undisclosed price. The deal marks the demise of a nearly three-decade relationship between the two companies and gives GM full control of the factory. ^ "Suzuki to stop selling autos in Canada". 26 March 2013. ^ McCausland, Evan (6 November 2012). "Six Suzukis That Should Have Been Sold Stateside". MotorTrend Magazine. Source Interlink Media. Retrieved 30 October 2013. Although Suzuki's American lineup offered little to quicken our collective pulse, the company did show a few occasional flashes of genius abroad, showing there were still a few enthusiasts trapped within the corporate walls. ^ Dowling, Joshua (27 October 2007). "The weird on wheels". Sydney Morning Herald. Retrieved 31 October 2013. Of all the Japanese brands, Suzuki is probably best placed to produce 'personal mobility devices'. After all, it is famous for making motorcycles as well as clever small cars. The PIXY is Suzuki's answer to Toyota's i-Real. The difference is that Suzuki has built a small van-like 'car' (called the SSC, for Suzuki Sharing Coach) that the PIXY docks into. So, you can drive on main roads in your SSC and then scoot along the footpath in your PIXY. It's a dream for now, but Suzuki already produces a small motorised buggy for the elderly, so maybe this isn't so far away after all. ^ Simister, John (30 October 2007). "Tokyo Motor Show: I have seen the future – and it's fun". The Independent. Retrieved 31 October 2013. Take those wheeled pods. For the third Tokyo show in succession, the latest variation on the theme was revealed: the i-Real. This is a motorised chair that leans back as it speeds up, and leans into corners. Its name suggests that Toyota is serious about this device. Do you think it could work? No, nor do I. Suzuki does, though, and takes the notion a stage further with its Pixy + SSC. The Pixy part is, again, a three-wheeled, single-seater pod, this time weatherproof with a windscreen and roof, two of which can dock inside the Suzuki Sharing Coach (SSC) for higher speeds and longer drives. Electricity comes from a hydrogen fuel cell and solar energy, and the SSC recharges the Pixies as it drives along. ^ Jeremy W. Peters (11 January 2005). "That's a Suzuki?". The New York Times. Retrieved 30 October 2013. Suzuki says a derivative of the Concept-X will be built sometime in 2006. By then, the steering wheel, which resembles one you would see on a jet, will most likely be cut from the plan. ^ Voss, Arv (14 June 2008). "2008 Suzuki XL7". San Francisco Chronicle. Retrieved 30 October 2013. The XL7 evolved from the Suzuki Concept-X, which debuted at the 2005 North American International Auto Show in Detroit. The midsize crossover SUV is stylish, roomy and versatile, lending itself ideally to its intended purpose. ^ "The 82nd Geneva International Motor Show". Global News. Suzuki Motor Corp. 6 March 2012. Retrieved 30 October 2013. ^ "2012 Beijing International Automotive Exhibition". Global News. Suzuki Motor Corp. 23 April 2012. Retrieved 30 October 2013. ^ Stevens, Mike (9 November 2011). "Suzuki Regina Concept Previews New City Car, Tokyo Debut Planned". The Motor Report. Retrieved 30 October 2013. Whether the Regina will replace the Alto is unclear, but Suzuki has at least confirmed that the new concept offers a preview of its next-generation city-car plans. The current Alto is less than three years old, so a replacement is likely sometime away. ^ a b Siler, Steve (9 November 2011). "Suzuki Totes Swift Sport and Three Concepts to Tokyo (Guess Which One We Want)". Car and Driver Blog. Hearst Communications Inc. Retrieved 30 October 2013. Suzuki may be struggling to maintain much of a presence in the U.S., but the brand remains a successful purveyor of small vehicles elsewhere in the world. Indeed, we could see the cars it's showing at the 2011 Tokyo auto show being received well in global markets—and there's one in particular that we wouldn't mind seeing here. A rundown of the quartet follows. ^ a b Woosey, Jason (9 November 2011). "Suzuki delivers quirky Regina concept". Independent Online. Retrieved 30 October 2013. The Regina concept will be unveiled at the Tokyo Motor Show in Japan early next month, alongside an even stranger little creature called the Q-concept. ^ "TEAM SUZUKI by Ray Battersby (2008) Parker House Publishing ISBN 0-9796891-5-5 / 0-9796891-5-5". Teamsuzuki.co.uk. Retrieved 5 October 2010. ^ R Kinnersly (23 November 2011). "Boost Ports". Model Engine News. Retrieved 10 October 2013. It has been used with outstanding success by the M.Z. designer, Walter Kaaden, who obtained a 20 per cent. power increase by combining this port with the standard Schnürle system. ^ "karimun wagon r". Karimun Wagon R. Archived from the original on 9 December 2014. Retrieved 11 July 2009. ^ Oxley, Matt (27 December 2012). "50 years ago: The Ernst Degner story". Motor Cycle News. Bauer Media. Retrieved 10 October 2013. Most remarkable of all, Suzuki and the other Japanese factories only built winning two-strokes after Suzuki paid star MZ rider Degner a king's ransom to defect from East to West and sell Kaaden's hard-earned secrets. ^ "motogp.com · Suzuki Motor Corporation suspends GP racing". Retrieved 28 November 2011. ^ "Suzuki return to MotoGP with Aleix Espargaro and Maverick Viñales in 2015". MotoGP.com. Dorna Sports. 30 September 2014. ^ Steven L. Thompson (8 November 2010). "L+S=MF (Cont'd)". Cycle World (Blog). Bonnier Corp. Retrieved 5 October 2013. In the September, 1966, issue of CW, Suzuki ran an ad for the X6 Hustler 250, a ferociously quick 250cc piston-port Twin with six speeds and "Posi-Force" oil injection. What made the ad stick in my mind all these years was the copywriter's line at the top: "We've invented a very fast way to lose 70 lbs." The point being, as the body copy of the ad made clear, that the Suzuki was as quick and fast as most 500s but it weighed much less. ^ "1966 Suzuki X6 Hustler". Jay Leno's Garage. NBC Studio, Inc. 10 April 2008. Retrieved 5 October 2013. When Suzuki introduced the X6 in the fall of 1965, it caused an immediate sensation. Developed with the goal of captivating the U.S. market, the Hustler was designed to be the fastest 250 cc motorcycle in the world. The bike featured Suzuki's first ever tubular steel double-cradle frame, and its air-cooled two-stroke sleeved aluminum cylinder engine was capable of just about 100 mph. Surprisingly sophisticated, this little engine achieved 100 hp per one liter cylinder volume, which meant it could outrun most of the bigger, faster bikes on the road. It featured automatic oil injection, but more importantly, it was the first six speed motorcycle ever to go into full production. ^ "Suzuki to revive Hustler name". Visordown. Immediate Media Company. 25 January 2013. Retrieved 7 October 2013. We can be pretty certain that whatever the new machine turns out to be, it won't follow the mechanical pattern of the original Hustlers, which were 250cc two-stroke parallel twins. Suzuki's new 250cc four-stroke twin, as used in the naked Inazuma, might be a good choice. ^ Beresford, Jack (29 January 2013). "Suzuki plotting return of the Hustler motorbike?". MotorbikeTimes.com. Retrieved 7 October 2013. Whatever the case, reports indicate that the update could be heavily influenced by the classic T20 and T250 Hustlers which became such an iconic part of the brand itself. ^ a b Melling, Frank (11 December 2004). "Kick start a blast from the past". Telegraph. Retrieved 5 October 2013. The powerplant of the Seeley Suzuki was closely derived from Suzuki's T500 Cobra road engine. ^ Melling, Frank (1 June 2005). "Memorable Motorcycles Suzuki T500". Motorcycle USA. Retrieved 5 October 2013. The T500 metamorphosed into the GT500 which had better brakes, suspension, electronic ignition – and less performance. Even so, the GT500 and T500 are very much siblings. Together the two models had a production life of over 9 years and this means that there are still many thousands of T500s in use. ^ Melling, Frank (6 March 2012). "Racing Daytona On a Cafe Racer". Motorcycle USA. Retrieved 5 October 2013. The motor, tuned for torque, was a dream. Pulling stupendously high gearing, the T500 was cruising round the banking at over 130mph – with speed still in reserve. Now, touring round at the back of the field was forgotten. Those AHRMA trophies looked good! ^ Choong En Han; Jeannette Goon (8 September 2013). "The workhorse nobody remembers". The Star Online. Star Publications (M) Bhd. Retrieved 5 October 2013. Efforts are being made to tell the story of two Suzuki T500 motorcycles which were once the workhorse of our traffic police. ^ "SUZUKI TM400 CYCLONE – The most dangerous bike ever built?". Off-Road.com. VerticalScope Inc. 1 November 2005. Retrieved 7 October 2013. Somewhere around 4000 rpm, the electronic ignition would go from a mild retard mode, to FULL ADVANCE, with no graduation at all. Bang! The proverbial light switch. What made this problem even more pronounced, was that the 'jump' never happened at the same rpm twice in a row. When it was cold, it might hit earlier. As the engine warmed up, it might jump 200 or 300 rpm later. But you could never predict exactly when. ^ Weeston, J. (11 February 2013). "Top Ten Worst Motorcycles of All Time". Xmotorcycle. Helmet Venture Inc. Archived from the original on 14 February 2013. Retrieved 7 October 2013. Imagine having an amazing amount of horsepower you could turn on instantly like a light switch. Now, imagine never quite knowing when that light switch is going to suddenly flick on and accelerate you forward to the point of making the Kessle Run in less than 12 parsecs. Also, you're off-road and it's 1971. ^ Weisel, Jody. "The Worst Bikes I Ever Rode". Motocross Action Magazine. Hi-Torque Publications, Inc. Archived from the original on 8 October 2013. Retrieved 7 October 2013. It would scare you. I loved the Suzuki TM125 Challenger and felt that the TM250 Champion was a decent bike, but the TM400 Cyclone was totally unpredictable. I take that back. If you expected bad things to happen, it never disappointed you. Once, at a night race on a '74 model, I thought someone was trying to pass me on my left side; it turns out that the back of my TM400 was swapping so bad that I could see it in my peripheral vision. Down a rough straight, the TM400 resembled a fish flopping on a beach. ^ "1975 Suzuki RM 125". Pelican Guano Motorsports. Archived from the original on 17 October 2013. Retrieved 11 October 2013. The '75 was the first year for the RM series. It actually was only made for 6 months as the TM was in production at the beginning of the year and at the year end Suzuki introduced the new RM series. ^ "The Life And Times Of The Suzuki RM250". Dirt Bike Magazine. Hi-Torque Publications, Inc. 12 December 2011. Archived from the original on 12 October 2013. Retrieved 11 October 2013. The liquid-cooled RM250 of 1982 reigns supreme as the best 250 of the year. It's faster, lighter and has better suspension than anything in the class. ^ Chaterji, Pablo (18 February 2005). "Suzuki RG 250 Gamma – Gamma Ray". Business Standard Motoring. Retrieved 5 September 2013. Cue 1983, when Suzuki presented the RG250 Gamma and turned the class on its head. Although many motorcycles had been called road-legal racers before the Gamma, the RG was perhaps the first mass-produced motorcycle with a lightweight aluminum frame and a racing-type aerodynamic fairing, and it started a new trend in the process. Suzuki used all their two-stroke knowledge and racetrack experience when building the Gamma and it showed – it was light, fast, handled superbly and was an instant box-office hit in the racing circuits. ^ Kodack, Anthony (17 October 2007). "Suzuki GSX-R750 Model Timeline". TopSpeed. Retrieved 8 October 2013. With the 1983 RG250 Gamma, Suzuki was the first factory to deliver a true racer replica using race-bred technology to the public. The next step was to build a 4-stroke 400cc machine for the Japanese home market and a year later a 750cc machine, culmination to the Suzuki's racing experiences in the World Endurance, AMA Superbike and Championship. The GSX-R750 was first presented at the 1984 IFMA Cologne Show in West Germany. Although it was fully street legal, it was clear that it was built even to compete in the various Worldwide Championships. ^ "Classic Test: Suzuki RG500 v Yamaha RD500LC". Visordown. Immediate Media Company. 21 December 2011. Retrieved 10 October 2013. The RG makes a claimed 95bhp, which translates to a genuine 78bhp at the wheel, all packed in a svelte 156 kilos with a genuine top speed of 144mph. But that's not all, it comes with an incredibly trick alloy frame, lifted straight off the race bike. Suzuki's glory days in Grand Prix may be going through a lean time, but the RG still bristles with purpose and lessons learned off the track. ^ Pole, Warren (16 September 2010). "Bike Icon: Suzuki RGV250". Visordown. Immediate Media Company. Retrieved 10 October 2013. Simply put, the RGV was nothing short of a revelation and a quantum leap forwards in performance and production bike technology. ^ "1982 Suzuki GS1000SV Katana". Classic Bikes from the AMA Motorcycle Hall of Fame Museum. American Motorcyclist Association. Archived from the original on 17 October 2013. Retrieved 16 October 2013. ^ Mackenzie, Niall (8 October 2010). "Niall's Spin: 1985–1986 Suzuki GSX-R750". Visordown. Immediate Media Company. Retrieved 12 October 2013. The first GSX-R750 (it was sold as a 400 in 1984 in Japan) was incredibly light at 176kg with sophisticated suspension and race-ready brakes. Oh yes, and it came with drop-dead gorgeous racer styling, to all intents looking like a factory endurance racer, and finished in factory colours to boot. In 1985 there was nothing sexier. ^ Milner, Doug (24 August 2012). "1985 24-Hour Motorcycle World Speed Record". Cycle World. Retrieved 12 October 2013. That wonderful lunacy took place in September of 1985 (for the December, '85, issue) when Cycle World set a 24-hour world speed record of 128.303 mph on a Suzuki GSX-R750. And not by a slim margin: We went 10 percent faster than the previous record, 117.149 mph, set in 1977 by Kawasaki with a modified KZ650. ^ McCraw, Jim (20 July 1997). "Motorcycle Wars: Japan's Latest Shots at Fortress Harley". The New York Times. Retrieved 13 October 2013. When Japanese clones began to arrive in the United States in the late 1980's – Suzuki's Intruder was the first – Harley was incensed that Honda had managed to duplicate its engines' distinctive sound, a result of Harley's simple crankshaft layout. Harley has applied for a trademark on the sound, a potato-potato-potato rhythm at idle and a staccato beat at cruising speeds. ^ Barker, Stuart (8 October 2010). "Bike Icon: Suzuki GSX-R1100". Visordown. Immediate Media Company. Retrieved 14 October 2013. For their cash, GSX-R1100 buyers got an oil/air-cooled 1052cc dohc, four-cylinder, in-line motor housed in a lightweight double cradle frame made from aerospace quality aluminium and, since their front wheels would be spending so much time in the sky, that was a necessary luxury. Like the 750, the GSX-R1100 featured SACS (Suzuki Advanced Cooling System) as well as the new TSCC (Twin Swirl Combustion Chamber) and a host of acronyms which helped give mucho grunt from 5000 revs. ^ Ash, Kevin (4 July 2000). "An even better Bandit". Telegraph. Retrieved 14 October 2013. So it will sell well, and our first ride suggests it deserves to. It's thanks to the engine that Suzuki has been able to keep the cost around the £6,000 mark, as the four-cylinder, air and oil-cooled transverse four debuted back in 1986, when it powered the fearsome GSX-R1100. ^ Urry, Jon (13 April 2013). "Road Test: Suzuki Bandit 1200 VS 1250". Visordown. Immediate Media Company Ltd. Retrieved 14 October 2013. Like a sleeper secret agent the Bandit has been doing its part to corrupt a generation of bikers into its wicked ways since it was launched in 1996. This big-bore monster was the first proper streetbike, boasting an air/oil-cooled 1,157cc motor that was very closely related to the legendary GSX-R1100's lump while its styling was simple, naked and designed to show off this heart of metal. It wheelied like a banshee and went round corners, too. A perfect example of the philosophy keep it simple. ^ "Products History 1990s". Global Suzuki. Suzuki Motor Corporation. Archived from the original on 6 October 2013. Retrieved 2 September 2013. ^ Siler, Wes (15 November 2010). "Retro: Suzuki DR Big". RideApart. RideApart Inc. Retrieved 15 October 2013. We first learned of Doctor Big, or 'Desert Express' as he's known by people with more mature senses of humor, in something of an aside in Kevin Ash's Tiger 800 review about Triumph being peeved that people (read: us) think the Triumph is unmistakably an effort to copy the [BMW R80]GS's design. It is, but Triumph argues that the BMW itself is simply a copy, of this Suzuki. And thus Doctor Big's place in history is assured. ^ a b "History". All New V-Strom 1000 ABS. Suzuki Motor Corporation. Archived from the original on 16 October 2013. Retrieved 15 October 2013. ^ Brown, Roland (9 November 1996). "Motoring: Bike to the future". The Independent. Retrieved 16 October 2013. Japan's brightest show stars come from Suzuki, whose TL1000S sportster combines a 123bhp V-twin engine with a racy chassis based on a lightweight aluminium frame. The TL features fuel-injection and an innovative rear damping system. ^ Melling, Frank (28 March 2013). "Memorable Motorcycle: Suzuki SV1000". Motorcycle USA. Retrieved 16 October 2013. So when the SV was launched the warning lights were well and truly lit on Suzuki's instrument panel. Gone was the frenetic rush of the eight-valve, dual overhead cam V-Twin which powered the TL. Instead, Sensible San in Hamamatsu re-cammed and re-mapped the same motor, so that it allegedly produced 120 hp – but felt about 20 hp less. The capacity remained at 996cc and the six-speed gearbox was retained from the TL but now the powerplant was a sportbike engine which the Health and Safety lobby would have us all ride. ^ Bennett, Jon (13 January 2009). "Suzuki DL1000 GT". Bristol Post. Archived from the original on 23 September 2015. Retrieved 16 October 2013. A couple of days later, however, I was in for a surprise. Having made a conscious decision to go out thrill-seeking, rather than just using the DL to commute, the smooth 1,000cc V-twin began to show its heritage. Based heavily on the tried and tested motor which once powered the frankly lunatic TL1000S and TL1000R sportsbikes of the 90s, the V-Strom showed remarkable venom once the revs really began to climb. The 90-degree V-twin which had previously been so gentlemanly had transformed into a fire-breathing monster. From 5,000rpm up to the redline, in gear after gear, the V-Strom has plenty of shove for the most brisk of overtaking manouevres. ^ Barker, Stuart. "600 Evolution 1985 – 2003". Visordown. Immediate Media Company. Retrieved 17 October 2013. Of the major Japanese players, this leaves only Suzuki to offer up a contender and the latest is obviously the famed GSX-R600, first launched in 1996. But there were two earlier offerings. 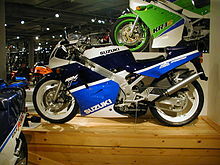 Back in 1992 in the 'States you could get a GSX-R600, although it was only a sleeved-down 750 engine in a 750 chassis. For the UK in 1993 came the RF600R – a powerful enough (100bhp) machine but one which had to pull too much weight. The beast tipped the scales at 195 kilos and was never going to be a genuine supersports contender, more a comfy, relaxed all-rounder for dad to enjoy. ^ Ash, Kevin (25 February 2006). "The joy of 600". The Telegraph. Retrieved 17 October 2013. Which means the GSX-R600 K6 (as the 2006 model is designated) is millimetre-perfect in going precisely where you want it to, steering with no tendency to run wide, drop in or do its own thing in any way. It's astonishingly stable, so much so that this is the defining characteristic of the handling, despite an improvement in agility and the GSX-R's history of flightiness. ^ Ash, Kevin (18 March 2011). "Suzuki GSX-R600 review". The Telegraph. Suzuki's 600cc engine has had a more substantial makeover than the 750's, with new pistons and combustion chamber shapes as well as the usual ECU and engine fuelling and ignition map upgrades, and the difference between old and new is marked. It's not so much about the top-end power, which doesn't feel significantly different, but the mid-range thrust is a lot better (far more helpful in terms of performance and usability). ^ Marmar, Shubhabrata (17 April 2008). "Suzuki GSX-R1300 Hayabusa -PERE-GRIN FALCON". Business Standard Motoring. Retrieved 16 October 2013. The Hayabusa was first shown to the world in 1998. Love blossomed from the press kit stage itself, and while a few detractors dug in their heels and obstinately referred to the thing variously as an ugly pig and a gigantic, shapeless buffalo, the rest of the world was not tuned in to that frequency. With magazines awash with top speed runs, the 314–321 kph records were peppered by considerable astonishment. The speed was possible despite – and not at the expense of – the Hayabusa's market-defined role – that of a comfortable sport tourer. ^ Ash, Kevin (10 December 2009). "Suzuki Hayabusa: the world's fastest production motorcycle". Telegraph. Retrieved 16 October 2013. We're saving the best number until last: how about zero to 180mph in 18 seconds? Glorious, and all this on a bike that will just as happily trickle all day around the supermarket car park. Last summer, that is why Pirelli chose the Hayabusa to launch its new Angel ST sport-touring tyre with a speed-record attempt – the bike duly averaged 143mph for 24 hours over 3,209 miles, including all fuel stops and rider changes, setting the world record for standard production bikes. ^ a b Ash, Kevin (4 August 2007). "Suzuki B-King is King of the road". The Telegraph. Retrieved 25 October 2013. Instead, six years on, the spirit of that show bike has been retained. The details are beautifully executed with exceptionally high-quality fit and finish, and the motor is based on the Hayabusa's imminent 2008 1,340cc unit rather than its slightly smaller and much older engine, which means a staggering 181bhp, making the B-King by far the most powerful naked street bike available. ^ Carpenter, Susan (12 December 2007). "Suzuki B-King is for Lord Vader. His chariot awaits". Los Angeles Times. Retrieved 25 October 2013. From the front end, the headlight looks like the face of a Hasbro robot. The turn signals blink from the outer edges of the tank. Travel down the bike's body to its curved radiator and finned oil cooler, and you're looking at what appears to be the Dark Knight's voice box. ^ Welsh, Jonathan (24 September 2008). "Suzuki's B-King Muscle Bike Is for Motorcycle Riders Who Want to be Noticed". The Wall Street Journal. Retrieved 25 October 2013. Viewed up close it looks, well, scary. If the B-King appeared in a feature film, the villain would ride it. Had 'Star Wars' been a biker movie, Darth Vader would have been in his element astride this Suzuki. The bike is menacing in black and has a mask-like shield around its headlight. Its pointy stinger tail and overall angular styling would go well with a cape. ^ "1999 Suzuki SV650". Motorcycle Online. VerticalScope Inc. 19 March 1999. Retrieved 23 October 2013. Although it's not incorrect to describe the SV650 as a naked, downscale TL1000S, it's not entirely accurate either. True, the 645cc liquid-cooled, 90° V-twin engine borrows more than a few bits and pieces from Suzuki's high-performance TL bikes such as lower exhaust cams and triangularly arranged crank and transmission shafts to reduce engine height and length, a rear cylinder head pipe that routes through the swingarm, an internal water pump, and all-electric instrument gauges. But the SV650 also receives a few new tweaks of its own, such as an oil guide that sprays oil directly on the gear faces. The SV650 also receives two 39mm Mikuni downdraft carburetors instead of fuel-injection, but considering the glitches we've experienced in the past with Suzuki's EFI, carburetion isn't that bad of an idea. ^ May, Keith (16 July 2008). "Frugal Fuelers: Suzuki SV650 – First Look". Cycle World. Retrieved 23 October 2013. This then-new standard from Suzuki had apparently charmed the riding pants off everyone at the office. 'So easy to flick back and forth that turning around and re-running ess-turns isn't just an option, it's a necessity,' Cycle World's May, 1999, issue declared. And shockingly, 'Better performance numbers than Ducati's Monster 900.' Other turn-ons included the short wheelbase, low center of gravity, relaxed riding position, competent suspension, decent brakes, smooth gearbox, narrow waist, wide handlebars and cozy passenger perch. The perfect companion for novice and hooligans alike. And stunning good looks to boot. ^ Cathcart, Alan (1 December 2000). "Suzuki SV650S And Kawasaki ZX-6R – Tweaks 2001!". Motorcyclist Magazine. Source Interlink Media. Retrieved 23 October 2013. Good news, bad news from Suzuki. As you'll see elsewhere in this issue, we are indeed getting the light, hot GSX-R600 and 1000 (that would be the really good news) but, contrary to some rumors, we are not going to see a TL1000-engined naked model for 2001. (Oh, and we wanted it so badly.) Still, there's plenty of good reason for V-twin fans to cheer, as the SV650S, a half-faired iteration of our favorite middleweight boomer, will finally come Stateside. Sporting a racier riding stance thanks to clip-ons replacing the naked SV's tubular affair, taller gearing and slightly revised steering geometry, the SV-S we get will be identical to the bike Europeans and Canadians have enjoyed for two years. Cool, eh? The naked SV650 returns unchanged, as do the Bandit 600, Katanas 600 and 750 and TL1000s S and R.
^ "MOTORCYCLE [GLADIUS]". Good Design Award. Japan Institute of Design Promotion. 2009. Retrieved 23 October 2013. ^ Ash, Kevin (19 December 2000). "Open the throttle for a big thrill". The Telegraph. Retrieved 24 October 2013. BUY a Suzuki GSX-R1000 today! Right now! It doesn't matter if you're normally into tourers, trail bikes or whatever. If there is any soul in you, any quest whatsoever to experience truly mind-expanding excitement, then at some point in your life you really must own – or at the very least ride – this latest flagship supersports machine from the 500cc grand prix world championship-winning manufacturer. This bike not only offers more than any road-going sports bike before it in terms of power, handling and braking, it also plugs the rider into its dynamics with such clarity and obedient responsiveness that it feels as if your very nerve endings have been spliced into the wiring loom. ^ Ash, Kevin (29 June 2002). "Press here for 'power' mode". The Telegraph. Retrieved 18 October 2013. Suzuki's entry into the new superscooter class might be something of a latecomer, but, if anything, it's been even more eagerly awaited than the first machine on this improbable scene, Yamaha's 500cc Tmax. This has nothing to do with the fact the Burgman has an even bigger engine – its 54bhp, 638cc twin includes such high-performance features as double overhead cams, fuel injection and liquid cooling – but its transmission breaks new ground even in this innovative category. ^ "scooter [Skywave650]". Good Design Award. Japan Institute of Design Promotion. 2003. Retrieved 4 November 2013. ^ "scooter [skywave series]". Good Design Award. Japan Institute of Design Promotion. 2006. Retrieved 4 November 2013. ^ "SCOOTER [SKYWAVE650LX]". Good Design Award. Japan Institute of Design Promotion. 2013. Retrieved 4 November 2013. Suzuki's flagship scooter, the Skywave 650, has been updated with its styling, functionality, and fuel economy. ^ "Suzuki set to increase output". BBC News. 22 January 2003. Retrieved 23 October 2013. Motorcycle production is set to be boosted by strong demand from China, and the release of a new 50cc scooter called 'Choinori'. ^ "Annual Report" (PDF). Suzuki Motor Corporation. 2003. p. 1. Retrieved 23 October 2013. In the overseas markets, motorcycle exports to North America and other markets increased, but exports to Central and South America, Europe and other markets dropped. As a result, motorcycle exports as a whole saw a decrease from the previous year. On the other hand, due to increases in North America, Europe and other markets, automobile exports surpassed last year's level. Under such circumstances, Suzuki made efforts to increase sales in the domestic motorcycle market by enhancing our product lineup through the introduction of models such as the Choinori and the SKYWAVE 650. Literally meaning 'short time riding', the Choinori is a functional domestically produced 50cc scooter available at a highly competitive price of 59,800 yen while the SKYWAVE 650 is a large-size scooter featuring the world's first electronically controlled CVT system. ^ "scooter [choinori]". Good Design Award. Japan Institute of Design Promotion. 2003. Retrieved 4 November 2013. ^ Winfield, Barry (13 March 2006). "Suzuki Boulevard M109R". Businessweek.com. Bloomberg L.P. Retrieved 25 October 2013. Nor does the new engine seem to notice the load it is being asked to carry. It's a 54-degree V-twin with dual overhead cams turned by a novel two-stage chain drive system that teams with a semi-dry-sump lubrication technique and plated aluminum cylinder bores to keep the engine relatively light and compact. Compact, that is, for a 1783cc twin with pistons that are 4.4-inches across. Fortunately for all of us, the engine uses a balancer shaft to keep the big twin's shaking forces from buzzing our brains out. ^ a b "Products History 2000s". Global Suzuki. Suzuki Motor Corporation. Archived from the original on 24 October 2013. Retrieved 25 October 2013. ^ Duchene, Paul (31 October 2004). "Rotary bikes are real spin cycles". Chicago Tribune. Retrieved 8 October 2013. Suzuki's RE5 arrived at the 1974 Tokyo Motor Show to huge fanfare. The hefty, 507-pound watercooled roadster used a 497-cc twin-rotor engine and sold for about $2,700. Suzuki rushed the RE5 into production, but a 3 1/2-month delay in delivery of the first bikes cooled demand. Then carburetor problems surfaced. Sales limped along until 1977, with only one production run of fewer than 5,000 bikes. The RE5 owners' registry lists 1,782 survivors worldwide. ^ "Happy Birthday, Felix: The Eleven Coolest Wankel-Powered Vehicles Built". Automobile Magazine. Source Interlink Media. 13 August 2012. Retrieved 8 October 2013. Despite licensing the engine from NSU, Suzuki poured much of its own research and development money into the RE5′s rotary mill. The company actually holds some 20 patents for different parts of the engine, including on the engine's subsystems. The Wankel was less than ideal for a motorcycle, however, as it had high fuel consumption and generated a lot of heat, necessitating the use of various systems for cooling. ^ "1976 Suzuki RE5 Rotary". Classic Bikes from the AMA Motorcycle Hall of Fame Museum. American Motorcyclist Association. Archived from the original on 11 January 2011. Retrieved 8 October 2013. To Suzuki's credit, the high-tech RE5 worked fairly well. But all that complexity resulted in a hefty curb weight of 573 pounds. That bulk, coupled with the rotary's large appetite for fuel, resulted in gas mileage in the 30 to 35 mile-per-gallon range at a time when Americans were facing gas crises. And the bike's limited cruising range didn't endear it to the touring market it was designed for. ^ Ash, Kevin (15 February 2010). "Hydrogen fuel-cell Suzuki tested". The Telegraph. Retrieved 26 October 2013. Suzuki plans to have a viable production fuel-cell two-wheeler on sale by 2015. It will cost more than a conventional, petrol-engined Burgman 125, which costs just over £3,000, but service costs will be minimal because the cell requires little maintenance and is intended to last the life of the vehicle. Compared with exorbitantly costly all-battery two-wheelers, there's no question hydrogen fuel cells present a more realistic alternative to petrol engines. ^ a b Burns, John (11 May 2012). "Days of Future Past". Cycle World. Bonnier Corp. p. 1. Retrieved 27 October 2013. The first memorable concept bike of the modern era may have been the Suzuki Falcorustyco (gyrfalcon in Latin – pictured above), which appeared at the 1985 Tokyo Motor Show. [...] Possibly still happily bemused at the reception the Falcorustyco had received, Suzuki was back at the 1986 Tokyoshow with the Nuda. This one, they said, is functional—not that anybody actually got to see it function. ^ "The 2WD Freak Show... – Suzuki Falcorustyco concept". Visordown. Immediate Media Company. 19 October 2010. p. 4. Retrieved 27 October 2013. In 1985 Suzuki produced this concept, the Falcorustyco. Really? It had a 500 cc square four water-cooled engine with 16 valves and 3 camshafts, no gearbox and relied on hydraulic pumps to provide final drive to both wheels. Front and rear swinging arms provided hub-centered steering and the bike had electromagnet brakes. ^ a b c d West, Phil (8 June 2010). "MCN's Top 10 concept bikes that were never made". Motorcycle News. Bauer Media. Retrieved 27 October 2013. We've all drooled over Honda's CB1100R concept bike, willing Honda to bring it to the UK. On the other hand there was Suzuki's B-King and Yamaha's MT-01 that did hit the showroom floors. But what about the others? Over the last 25 years there have been dozens of show specials or concept bikes that the leading manufacturers have teased us with, never to go into production. ^ Diaz, Jesus (16 June 2010). "They Actually Had Real Tron Bikes In The '80s". Gizmodo Australia. Allure Media. Retrieved 27 October 2013. Sometimes you look back in time and you see industrial designs that seem to be timeless. Like the Suzuki Nuda. It could come from 2045 or 1986, the year when it was actually introduced as a fully functional 174mph prototype. ^ "'The future' 25 years on". Visordown. Immediate Media Company. 22 March 2012. Retrieved 27 October 2013. The wonder of the internet means documents that once could only have been found by rooting through reams of hidden paperwork or scrolling endless microfilm rolls are available to anyone who cares to look. But as far as we know no publication has ever revealed these images showing the secrets of the most advanced motorcycle of the 1980s. ^ Conner, Blake (7 March 2007). "2008 Suzuki B-King – First Look". Cycle World. Bonnier Corp. Retrieved 28 October 2013. Details on this much-hyped motorcycle were still suppressed by our Suzuki hosts, but the bike does closely resemble the showbike that raised our temperatures in the first place, even if, as previously announced, the concept B-bike's turbocharger didn't make the translation. ^ Burns, John (11 May 2012). "Days of Future Past". Cycle World. Bonnier Corp. p. 2. Archived from the original on 5 November 2013. Retrieved 27 October 2013. Suzuki sold a few, mostly to owners who must've parked the things under a cover once the honeymoon was over and reality set in. You really don't see many B-Kings running around, do you? It's destined to be a serious Craigslist bargain in another few years when owners throw in the towel after admitting that fashion is never going to catch up to this motorcycle. ^ "Road sports bike [GSR series]". Good Design Award. Japan Institute of Design Promotion. 2006. Retrieved 4 November 2013. ^ "Lost in translation". Visordown. Immediate Media Company. 22 April 2013. Retrieved 28 October 2013. Nobody would call the B-King beautiful when it was shown as a concept bike, but onlookers clamoured for the machine to be put into production nonetheless. It was just so brutal. ^ Burns, John (11 May 2012). "Days of Future Past". Cycle World. Bonnier Corp. p. 2. Archived from the original on 5 November 2013. Retrieved 28 October 2013. Suzuki sold a few, mostly to owners who must've parked the things under a cover once the honeymoon was over and reality set in. You really don't see many B-Kings running around, do you? It's destined to be a serious Craigslist bargain in another few years when owners throw in the towel after admitting that fashion is never going to catch up to this motorcycle. ^ Hanlon, Mike (31 October 2003). "Suzuki's radical G-Strider concept". Gizmag. Retrieved 28 October 2013. The G-Strider is as interesting and radical as it looks, and in many ways it builds on the direction taken by the Burgman 650 cc scooter tested in Gizmo last year and simply bristles with new ideas and functionality. ^ a b Burns, John (11 May 2012). "Days of Future Past". Cycle World. Bonnier Corp. p. 3. Archived from the original on 5 November 2013. Retrieved 28 October 2013. What the G-Strider did get right was its 'nextgeneration telematics system, with interactive communications over a bidirectional wireless infrastructure...all controlled via glove-friendly trackball.' Which is actually similar to the thumbdrive controller that sorts through all the electronics on BMW's new K1600s. This wouldn't be the first time BMW took some good cues from the generally proletarian Suzuki. [...] In 2007, Suzuki went so far as to announce that the Strat would be entering production at an unspecified future time. Shortly thereafter, as you may have noticed, the free-market system imploded, and our Suzuki contacts claim to have no knowledge of what became of the bike. ^ Hanlon, Mike (31 October 2005). "Suzuki's Stratosphere unveiled: 180bhp, 1100cc six-cylinder machine". Gizmag. Retrieved 28 October 2013. The raw figures are 1100cc, 24 valves, 180 horses and a motor reportedly turbine-like smooth. The motor is an engineering masterpiece akin to the miniaturized sophistication of a Swiss watch and the aluminium fairing, electrically-adjustable windscreen, LED headlights, adjustable handlebars, built-in GPS navigation just add to the high-tech cred. We're not so sure about the orange seat, but love the Katanesque profile. ^ Barker, Stuart (5 August 2012). "The Joy of Six... (cylinders) – Suzuki Stratosphere". Visordown. Immediate Media Company. Retrieved 28 October 2013. Probably the single most interesting concept bike shown in the last decade, Suzuki's Stratosphere briefly looked like it might reach production. Those hopes have now receded, with sales for expensive naked bikes dropping away sharply worldwide. ^ a b "Suzuki at the 2007 Tokyo Motor Show". Global News. Suzuki Motor Corp. 1 October 2007. Retrieved 28 October 2013. ^ "Suzuki Biplane Concept – First Look". Cycle World. Bonnier Corp. Archived from the original on 9 November 2013. Retrieved 28 October 2013. This is the Suzuki Biplane, penned at Suzuki's recently re-opened U.S. design center. Suzuki's goal was to give the rider the sensation of flying in a vintage biplane with no canopy, a distilled, in-the-wind riding experience. It (conceptually) uses a V-Four motor, with cylinder heads and exhaust headers visible on the sides, just like the fabric-skinned twin-wingers of the last century. The front end gets a girder fork (kinda like the Confederate Wraith) and rim-mounted brake discs (a la Buell XB). The exhaust is tucked in underneath the cowling, and the link-type rear suspension can be seen under the tractor-style seat. ^ a b Garrett, Jerry (29 October 2007). "Tokyo Motor Show: Two-Wheel Thunderdome". The New York Times. Retrieved 28 October 2013. The Suzukis are wild. Silent runner: the Crosscage is a fuel cell bike that really works; no gas engine at all. The powerplant is made by Intelligent Energy of the U.K., the same group that made the ENV fuel cell bike I tested — and thought was viable even if it sounded like a U.F.O., not a bike. The Biplane supposedly has a V-4, but the show bike is most likely a make-believe mockup. Looks to be straight out of a video game. When will either Suzuki be produced? Right after the 12th of Never. ^ Newbigging, Chris (24 October 2007). "Tokyo Show: Suzuki unveil gemma concept scooter". Motorcycle News. Bauer Media. Retrieved 28 October 2013. The 250cc four-stroke scooter has a long, low riding position designed specifically to transport two adults around a city in comfort, according to Suzuki. The large dual seat is almost completely flat to keep rider and passenger weight low, and a large lockable cubby hole in front of the rider is big enough to take a helmet. The gemma is currently just a concept, but the concept appears well developed enough to reach production if the Japanese public like the idea. ^ "First Look: Suzuki Gemma 250". Visordown. Immediate Media Company. 3 July 2008. Retrieved 28 October 2013. The scooter looks set for the Japanese market only for the time being, but given the recent fuel price hikes there are strong rumours of it finding its way over here. Using the motor from the four-stroke 250cc Burgman, but with a new management system, the bike will be a full seven kilos lighter than the Burgman, 10cm longer with a longer wheelbase for stability. ^ "Suzuki sponsors FIS Nordic World Ski Championships Sapporo 2007". Global News. Suzuki Motor Corp. 29 January 2007. Retrieved 29 October 2013. Suzuki Motor Corporation will sponsor FIS Nordic World Ski Championships that will be held in Sapporo, Japan from February 2007. ^ Michael, Long (20 July 2010). "Suzuki sponsors Australia's National Snowsport Championships". SportsPro Media. Henley Media Group. Retrieved 29 October 2013. The national and internationally recognised authority governing competitive snow sports in Australia, Ski & Snowboard Australia, has signed the Australian branch of the Japanese automobile manufacturer Suzuki as the official sponsor of the upcoming National Snowsport Championships. ^ "Suzuki becomes title sponsor of ASEAN Football Federation Cup". Global News. Suzuki Motor Corp. 7 August 2008. Retrieved 29 October 2013. The AFF Suzuki Cup 2008 is the biggest football tournament in the ASEAN region since 1996. Aimed at raising the standard of ASEAN football to a world-class level and at making football more popular in the region, it will decide the top footballing nation among the AFF's 11 members: Brunei, Cambodia, Indonesia, Laos, Malaysia, Myanmar, the Philippines, Singapore, Thailand, Vietnam, and Timor-Leste. ^ "Suzuki is again title sponsor of ASEAN Football Federation Cup". Global News. Suzuki Motor Corp. 4 August 2010. Retrieved 29 October 2013. Suzuki Motor Corporation is pleased to announce its renewed support for the ASEAN Football Federation (AFF) Cup as the tournament's title sponsor. Suzuki was title sponsor for the first time in 2008. "Suzuki to pull out of China market amid sluggish sales of small cars". The Japan Times. Bloomberg News. 5 September 2018. Retrieved 3 April 2019. Wikimedia Commons has media related to Suzuki vehicles.